I’m not sure why exactly, but my husband has gone on an elbow-tearing bender with his work shirts. Right in front of my eyes he tore the elbows out of two shirts while putting them on yesterday morning! We’re trying to keep to a budget these days (and try to live frugally and consciously in general) so I decided to try to mend the shirts to avoid buying new ones (four in total!!!). 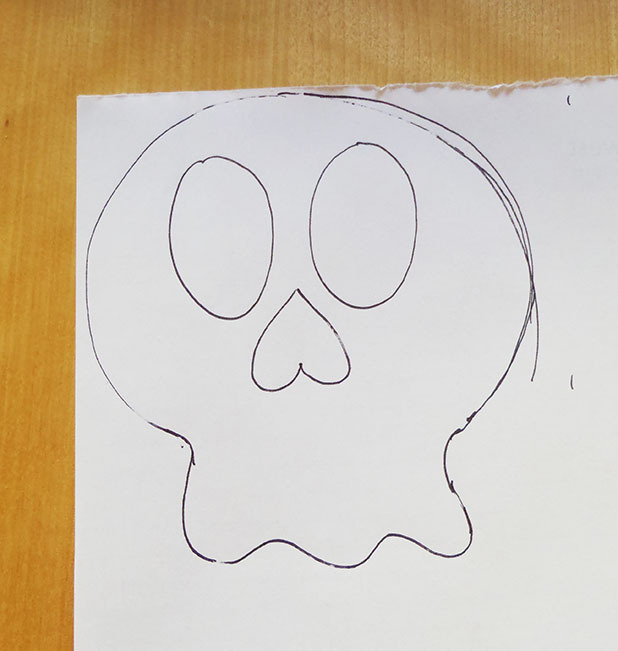 I’ve written up a little tutorial here that I hope is easy to follow! 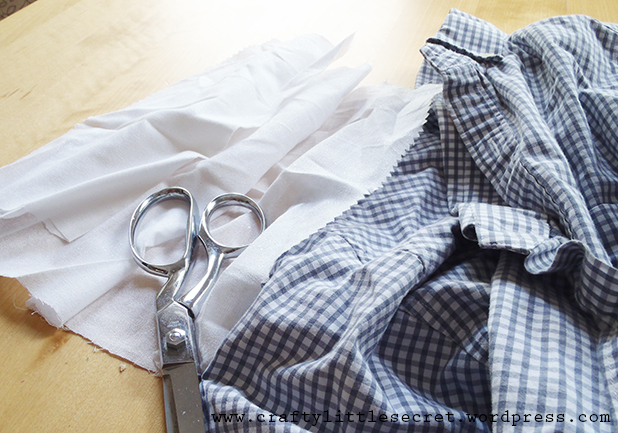 To add some stability to the torn area, I first started by fusing a small patch of interfacing to the shirt. 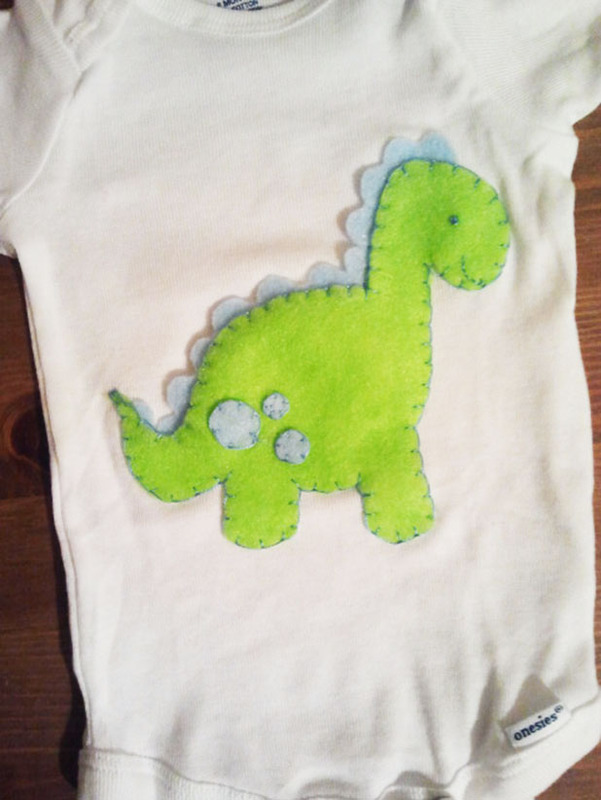 Fusible interfacing is two-sided; fabric on one and little bumps of glue on the other. You can see in the picture below the smooth side of the interfacing is in the foreground and the fusible side in the back. 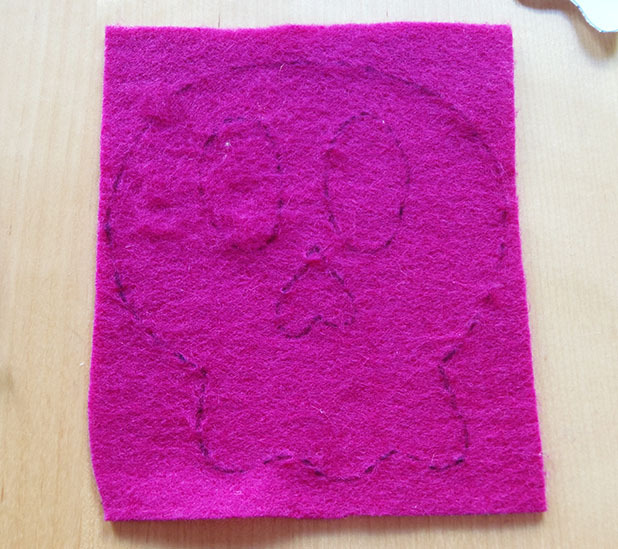 I cut a patch of interfacing about at least a half inch larger than the tear in each dimension. I’ve also found with past experience that round edges are less likely to peel up than sharp corners, so cut out a oval rather than a rectangle. 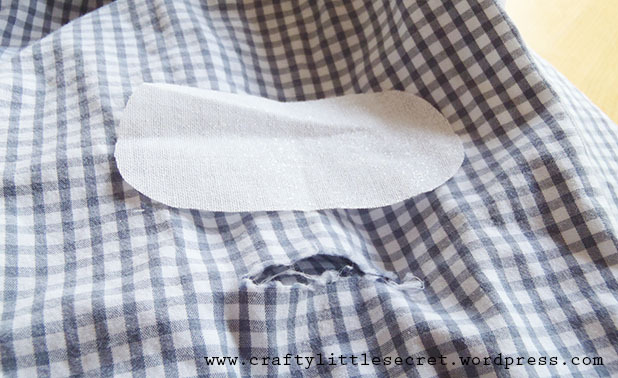 Lay the shirt on the ironing board then lay the interfacing patch on top of the tear, glue bump-side down (contacting the shirt). 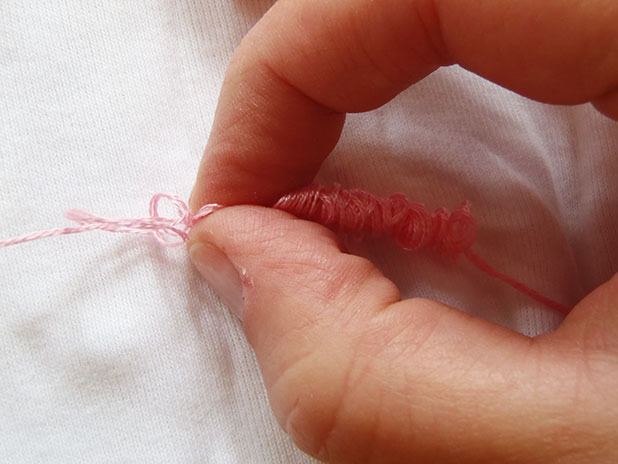 Try to pull the tear together as much as possible so that the two torn sides of fabric are in contact. 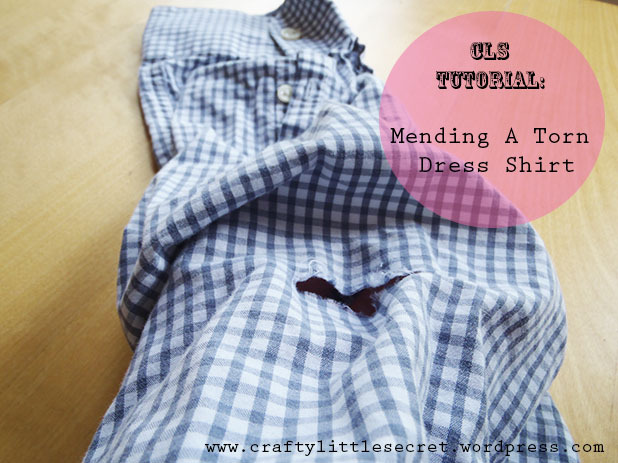 This will make your mending job easier and less noticeable. Set your iron to as high a heat as your fabric will allow and iron with even, firm pressure for about 15 seconds then allow to cool. First neaten up the tear by trimming any loose threads that are hanging off the shirt. 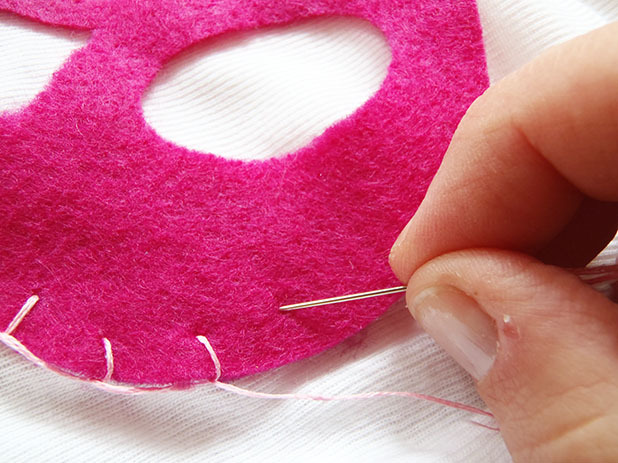 Next, you need to sew the tear itself closed. You’ve got two options for this depending on how noticeable you want the final tear to be. 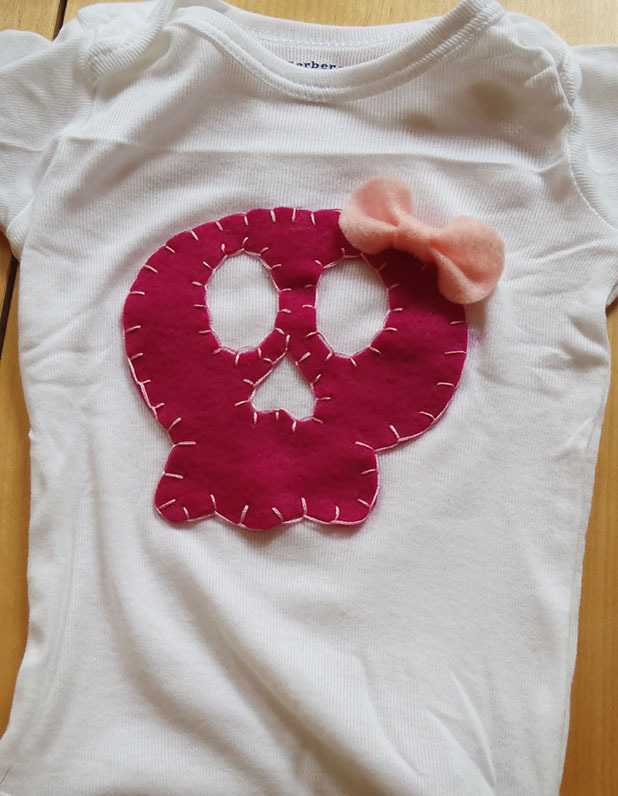 Option 1 is waaaaaaaaaaaaaay faster, but definitely a more noticeable mend and may work better on non-patterned shirts. 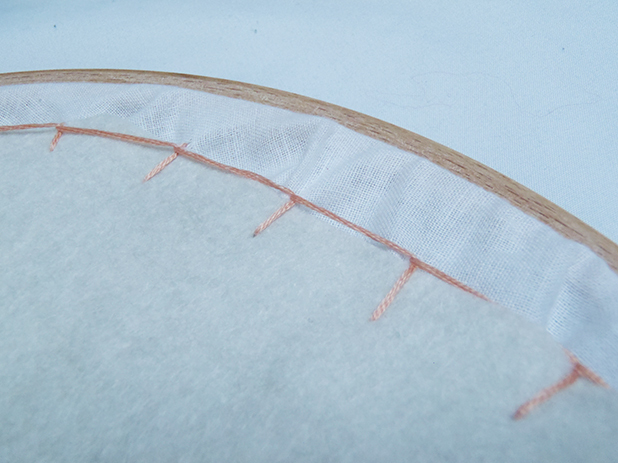 Option 1: Set your sewing machine to a wide zigzag stitch and top stitch over the tear, making sure to backstitch at the beginning and end of the sew and to catch both sides of the tear while sewing. 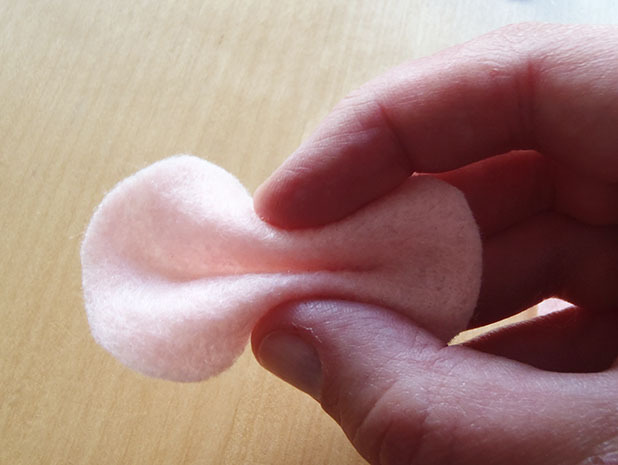 You’re left with a neat mend, but one that can definitely be noticed. 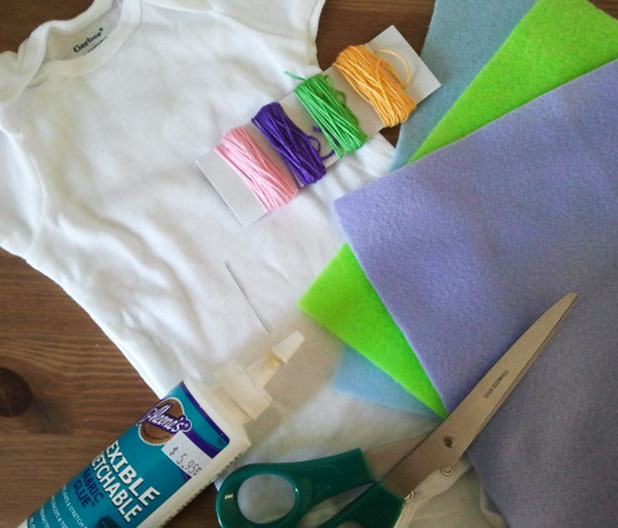 I tried Option 1 first, but since my husband was going to be wearing these shirts to work and potentially meeting clients, I decided to take the time to do Option 2, an (almost) invisible repair. 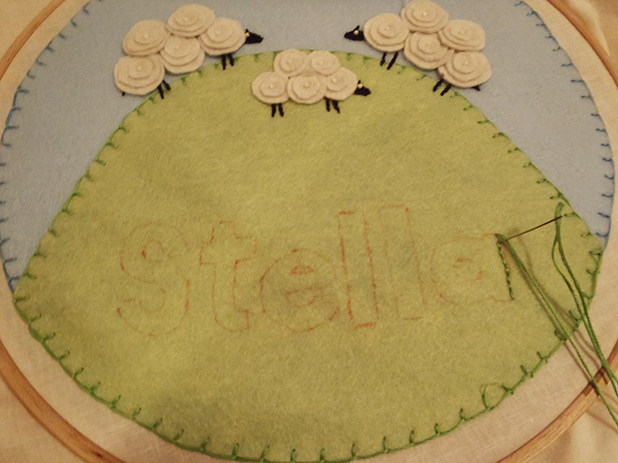 Option 2: This option is much more tedious than the first because it requires hand-stitching. 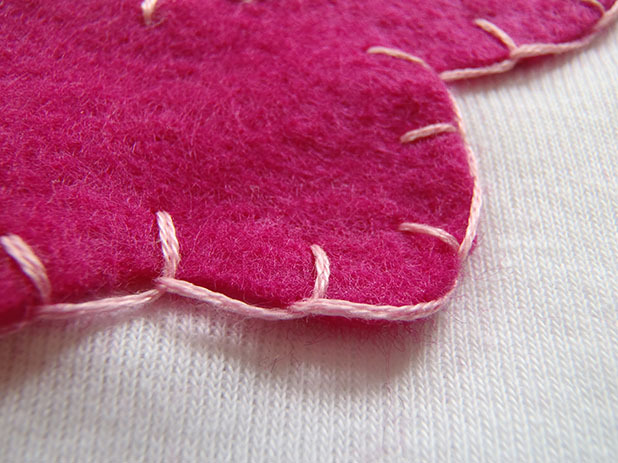 Using the smallest stitches possible, I sewed over the tear making sure to catch both sides of it. 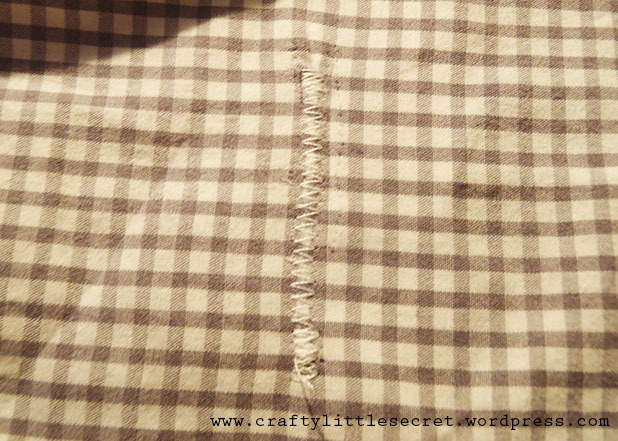 Since this was a patterned shirt, as I sewed I tried to keep my stitches with the white thread to the white parts of the check pattern. 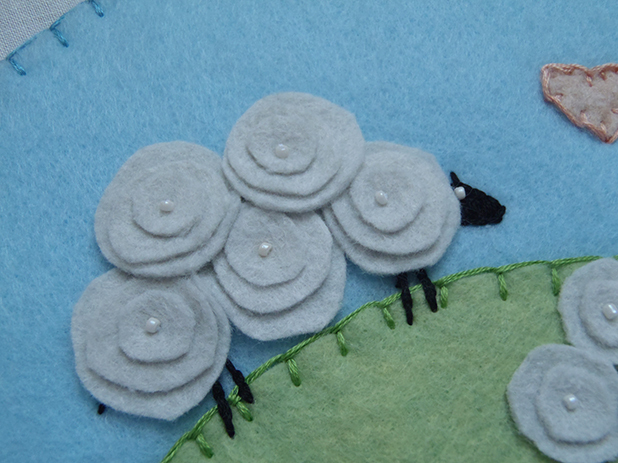 I then sewed in a similar fashion about 2 mm around the tear for extra stability. Tear??? What tear?? 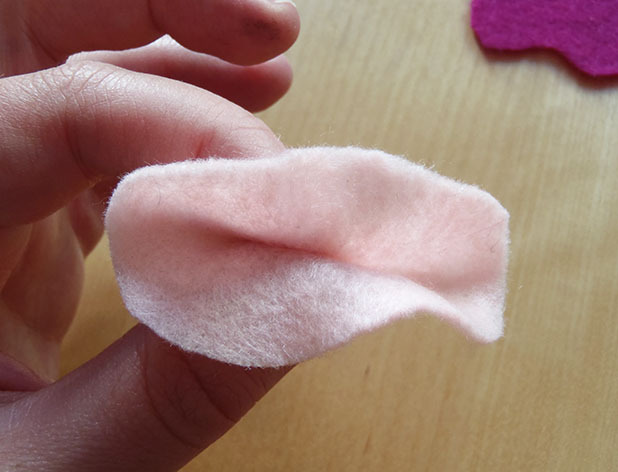 Ok, it’s not quite invisible and you’ll never have a perfect mend but this is pretty darn close!!! Keep in mind this image is zoomed in on the tear and when he’s wearing it, you’re really hard pressed to find it! 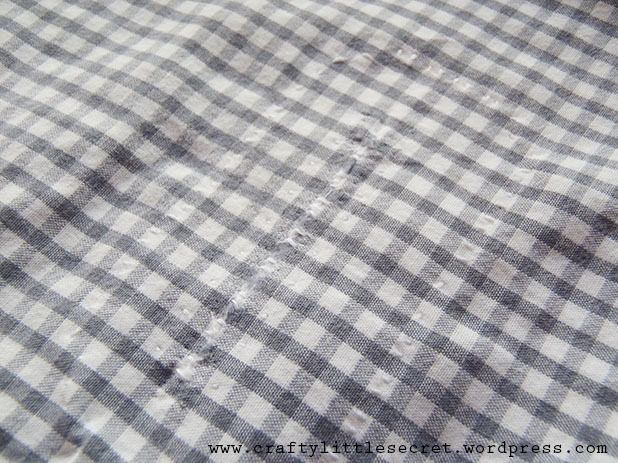 I find that over successive washes, fusible interfacing often starts to peel up off the fabric it was attached to. 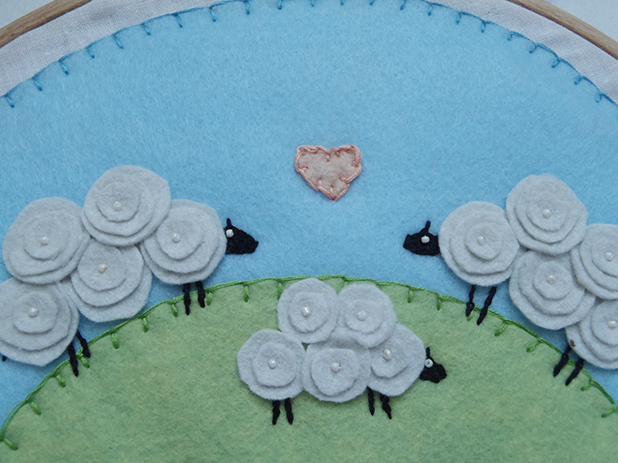 To try to keep this from happening, I also used tiny stitches around the perimeter of the patch, keeping to the white parts of the pattern to secure the edges of the interfacing and add extra stability (You can just make this out in the picture above). I’m hoping these repairs, hold up in the wash and I don’t find myself repeating this process too often! Fingers crossed! 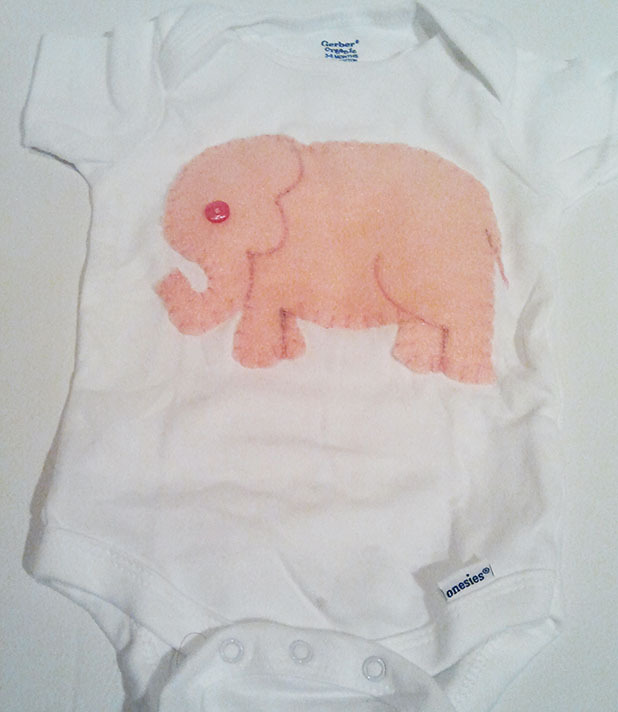 This entry was posted in Patterns and Tutorials, Refashioning/Mending, Sewing Projects on September 12, 2013 by missphd. 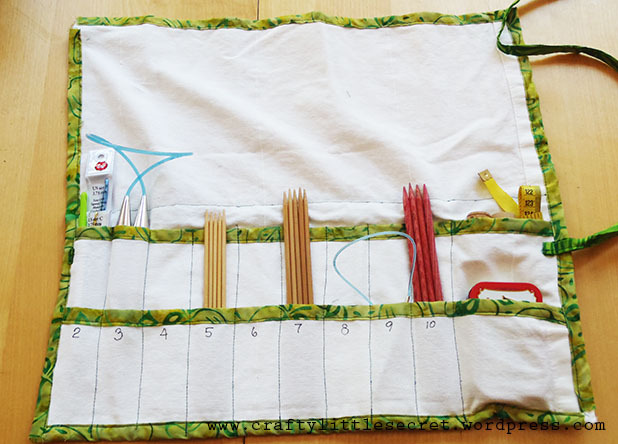 After wrestling with a messy bag of loose yarn, needles and other knitting bits, I finally decided that it was time to make a proper wrap to keep my knitting needles organized. It’s a simple project that takes just a couple hours from start to finish (or less with a few shortcuts!). 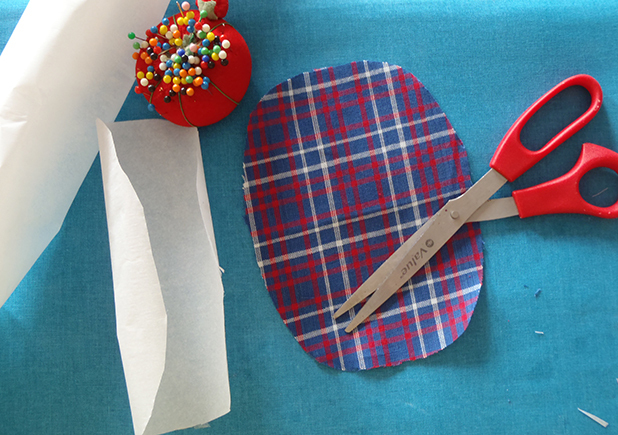 **To make your life easier and your project neater, try to choose a fabric without obvious right and wrong sides. A heavy cotton will hold up well. I used the leftover scraps from some curtain panels. 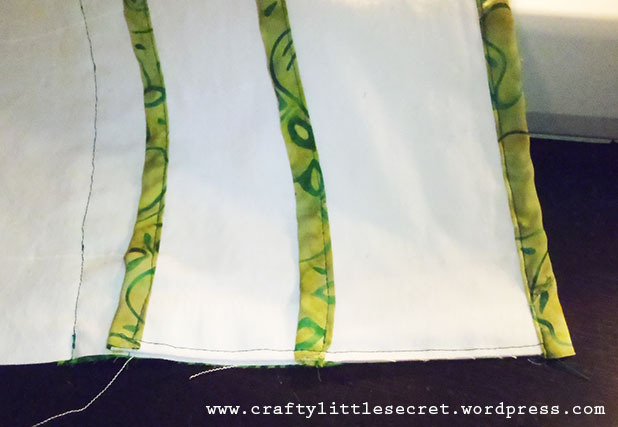 This step is essentially creating your own bias tape, so it can be a real time saver to just use bias tape for this step instead of contrasting fabric as I have here. 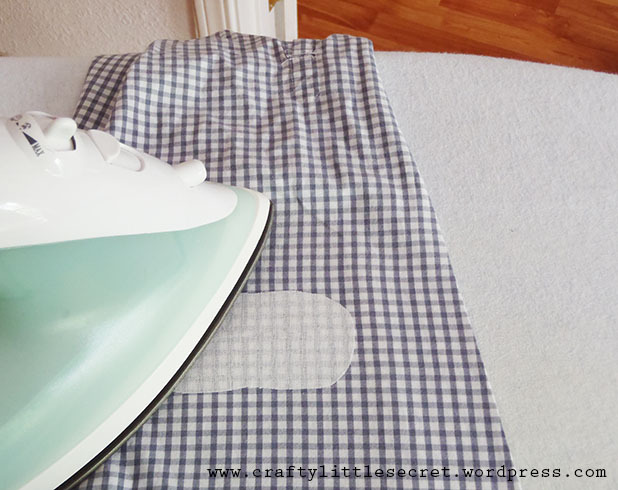 To create your edging you’re going to want to make sure your iron is heated up! 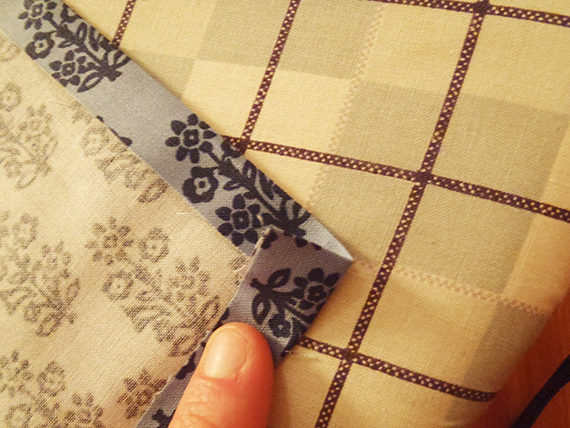 First, press each strip of fabric in half length-wise, creating a center crease (wrong sides together). 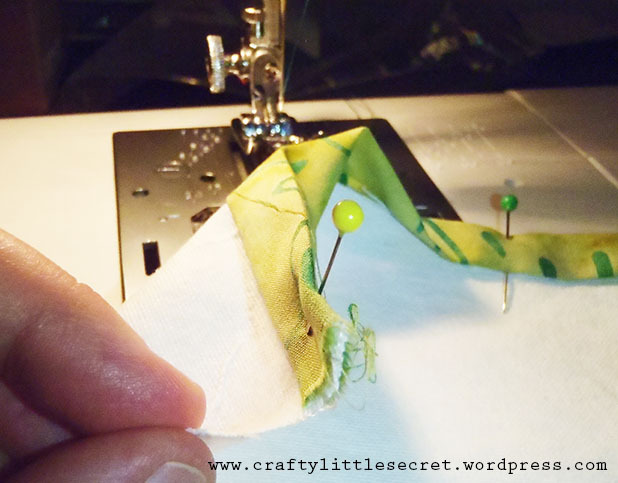 Open up the folded fabric, then bring each long edge to the center crease and press again. 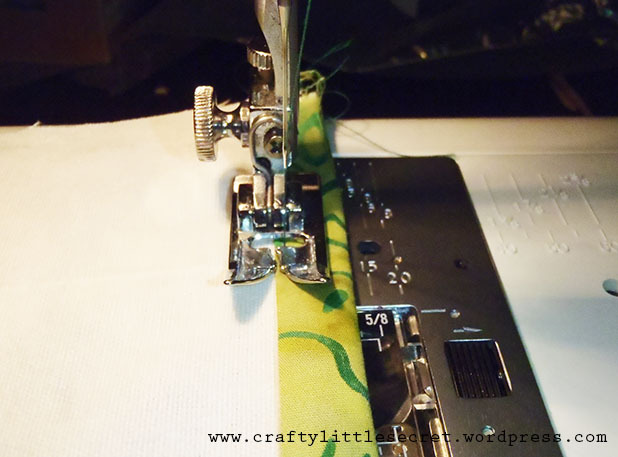 You should now have a long strip of fabric about 1″ wide with two long edges folded to meet in the middle. 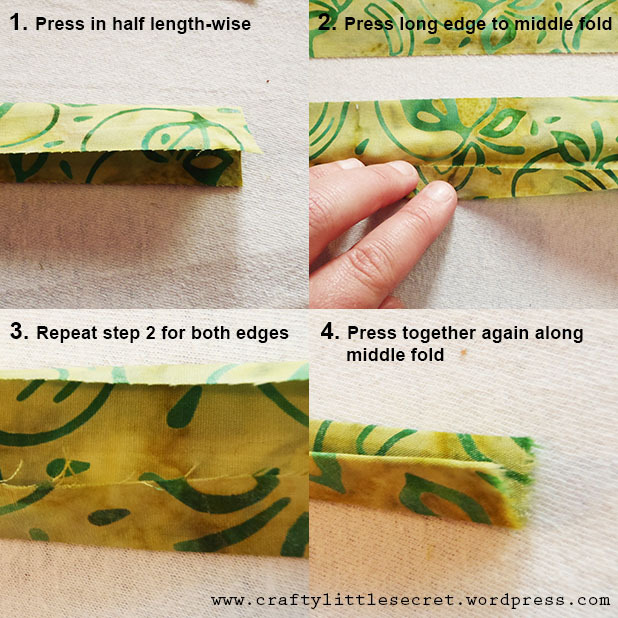 Finally, recreate that strong center crease by folding the fabric in half length-wise again, hiding the fabric edges on the inside. 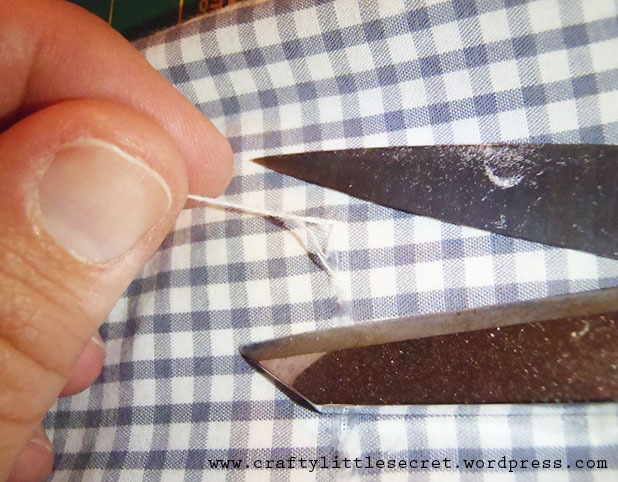 Press the fabric for the ties (skip this if you’re using ribbon for the ties instead) in the same manner. 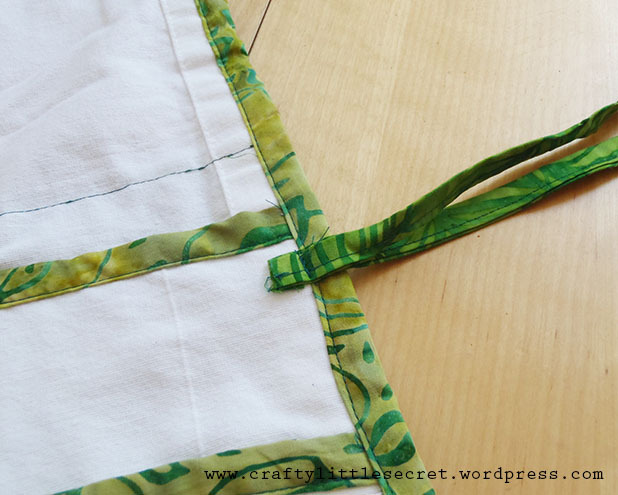 While you’re at it, with wrong sides together, go ahead and iron a half inch seam allowance along the long edge of your contrasting fabric for the decorative strip around the outside of the wrap. 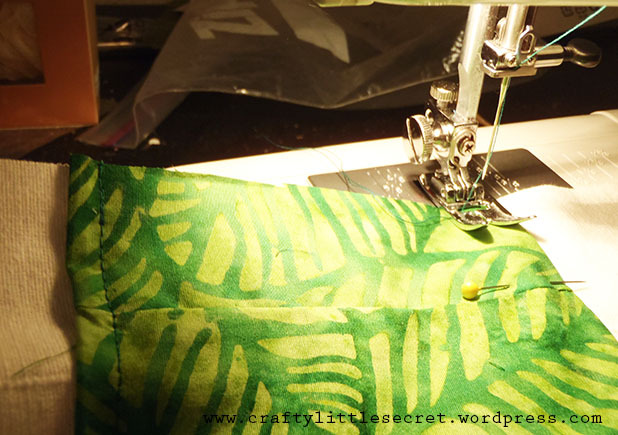 Take the 18″ x 6″ contrasting fabric you just pressed and top-stitch it to what will be the outside of your wrap on the largest piece of main fabric. 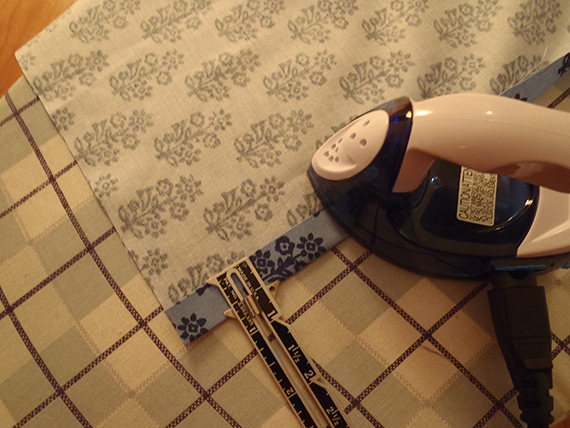 Placement doesn’t need to be precise but the top of the strip should be around the middle of the main fabric. Something to take into consideration if you’re using contrasting fabrics is that the stitching will be visible from the other side. 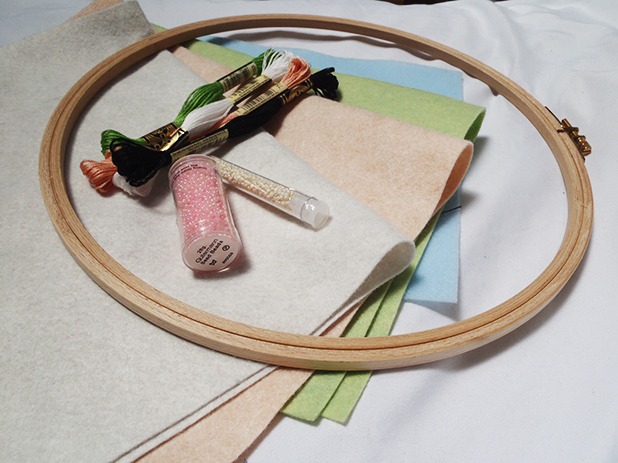 So if you care about that (which I don’t on a project like this) you may want to match your needle thread to the decorative panel and your bobbin thread to your main fabric. 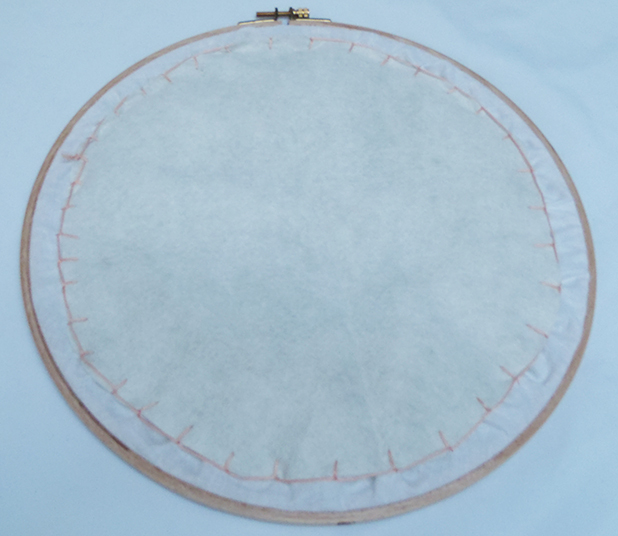 Using 3 of the 4 pieces of 18″ long edging, pin one piece of edging to each piece of main fabric along the 18″ side. You’ll want to insert the piece of main fabric into the edging fold so each side of the main fabric has decorative edging on it. 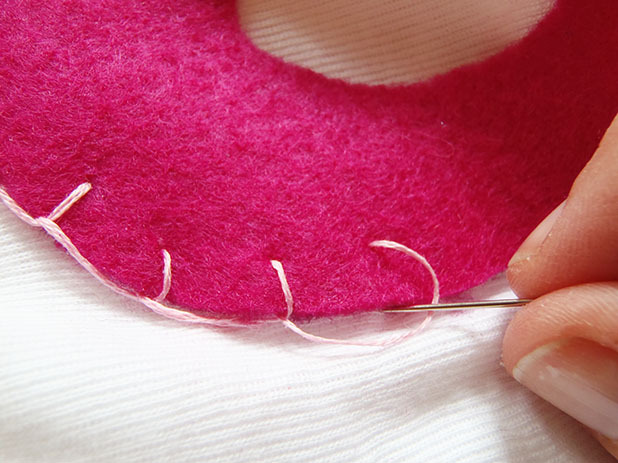 Now carefully sew along the edging as close to the open side as possible. 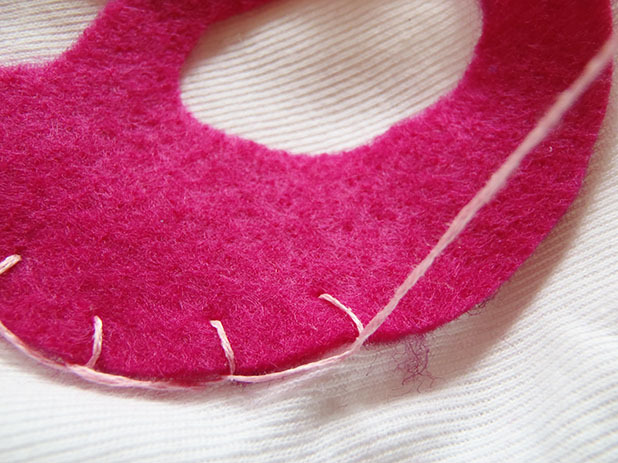 Remember that these stitches are meant to catch both sides of the edging fabric, so check periodically to ensure you are doing so. 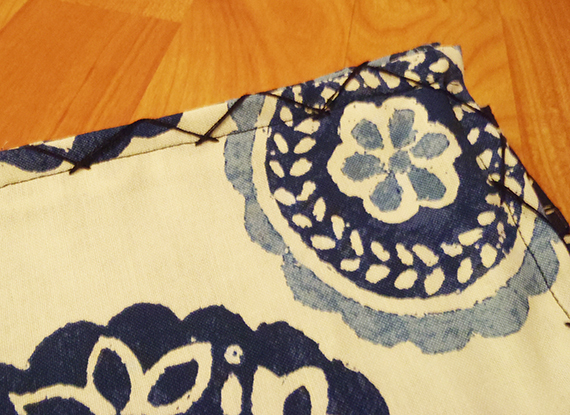 You should now have three pieces of your main fabric, each with a strip of edging sewn to one of the long edges. 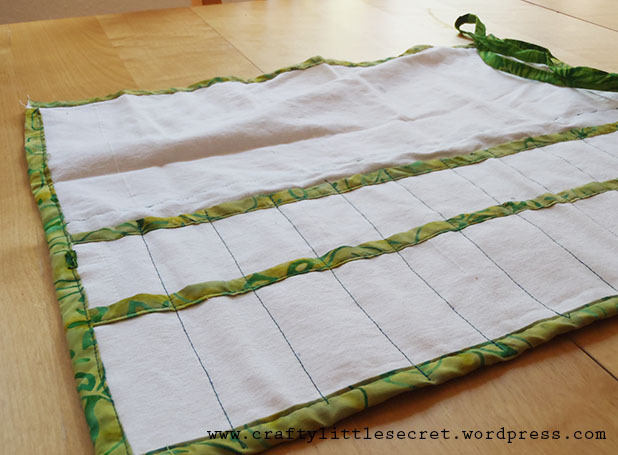 Line up your three pieces of main fabric along their bare bottom 18″ edge and baste all three together. 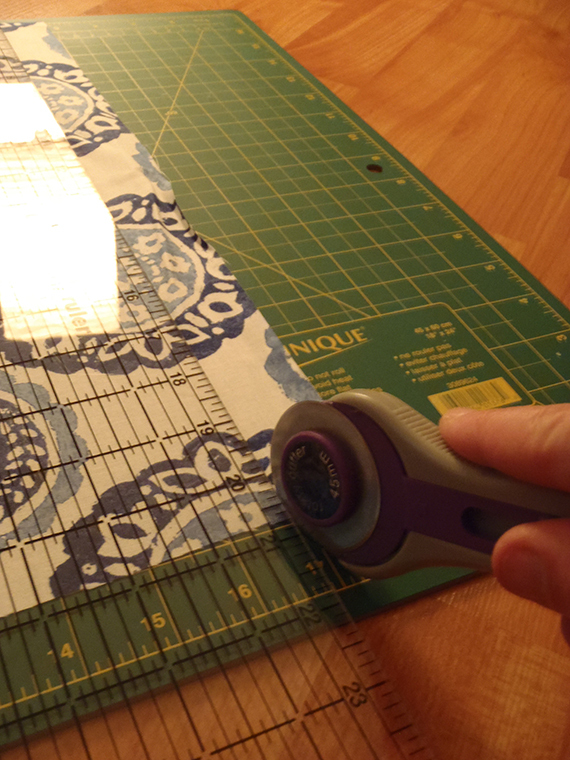 This basting step makes it way easier to sew the edging on. 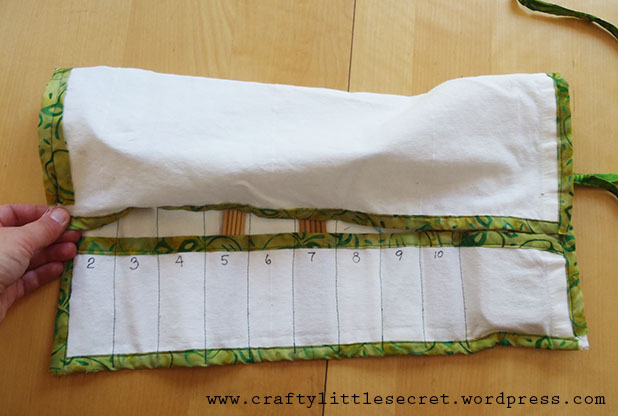 Now sew your final piece of 18″ length edging around this bottom edge. This stack will be a little thicker than the first edges so make sure your catching both sides of the edging/bias tape when you sew. 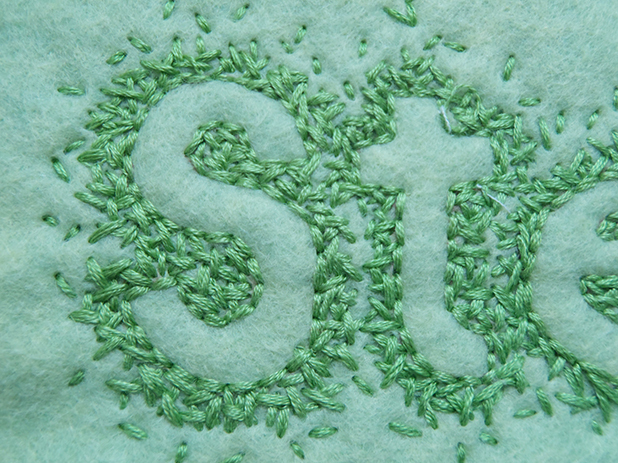 (Notice on this picture the stripe of green stitches – this is showing through from the decorative strip on the outside of the wrap and can be avoided as I described above). 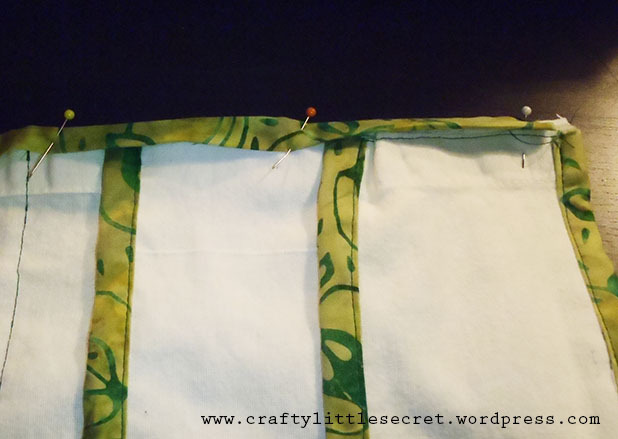 Next, baste the overlapping sides of the fabric as you did along the bottom edge (this is visible in the picture above), then cover these with the 17″ long edging strips. 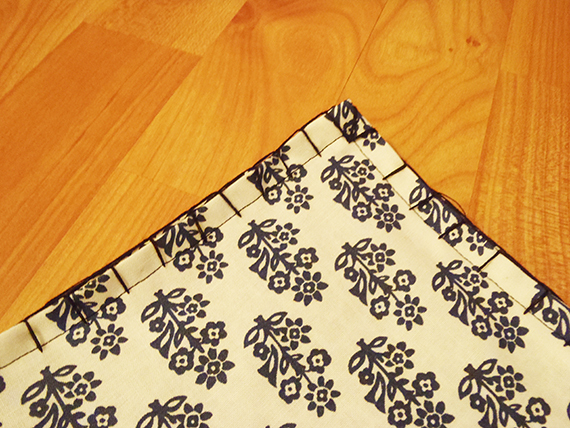 The sides of the main panels are 16″ long so you should have about an inch of overhang with the edging. 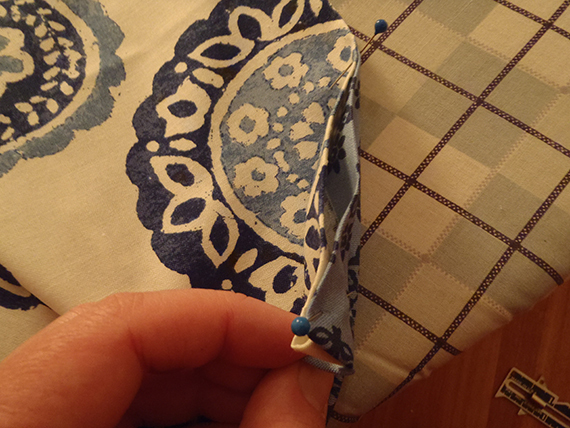 Center the edging so you’ve got a half inch of overhang on either end, then fold under and pin before sewing. Step 6: Sewing the ties. This is another easy shortcut for this pattern. 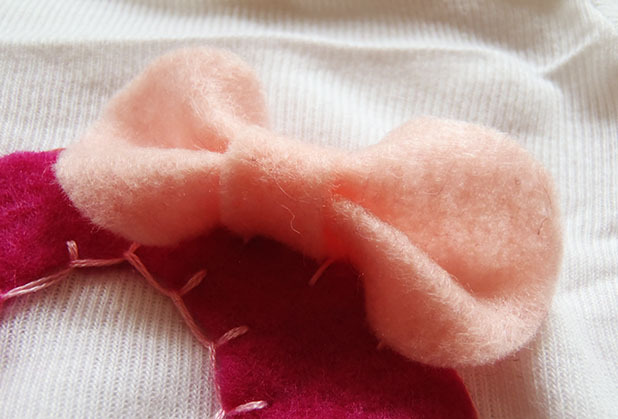 Instead of making your own ties, you can simply buy lengths of coordinating ribbon. If you’re making your own ties you should have them pressed as you did for the edging. Top-stitch the ties as close as possible to the open edge. 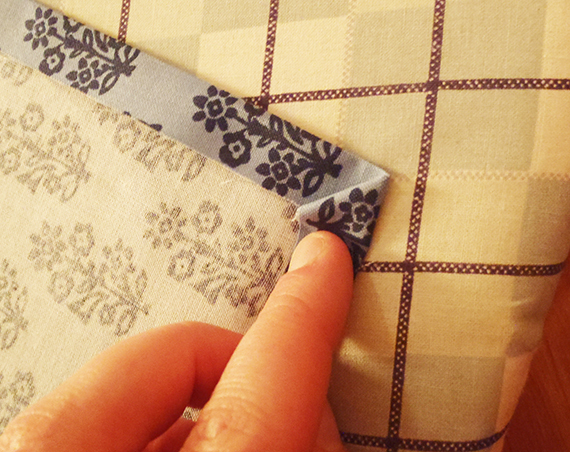 Once you’re ties are made you can sew them the right side of your wrap on the inside. Try to line them up with the center of the outside decorative strip. 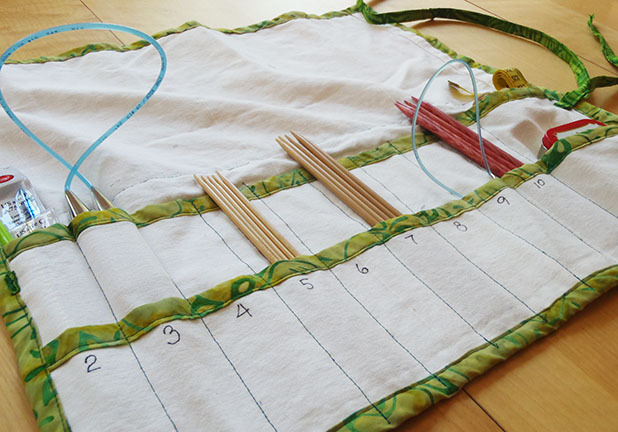 The final step is just to sew some pockets to hold your needles and notions. 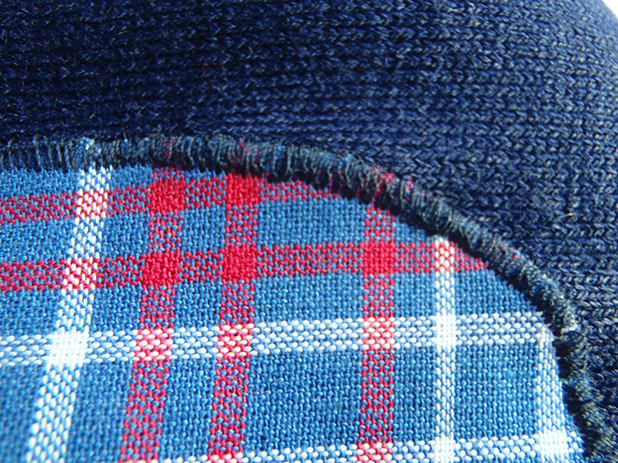 Top-stitch straight lines from the bottom edge of the wrap to the top of the second pocket (8″ height). I sewed one of these lines every 2 inches because I rarely use really chunky needles. My size US19 needles barely fit in a 2″ pocket, so if you have a lot of chunky needles you may want to consider different spacing. 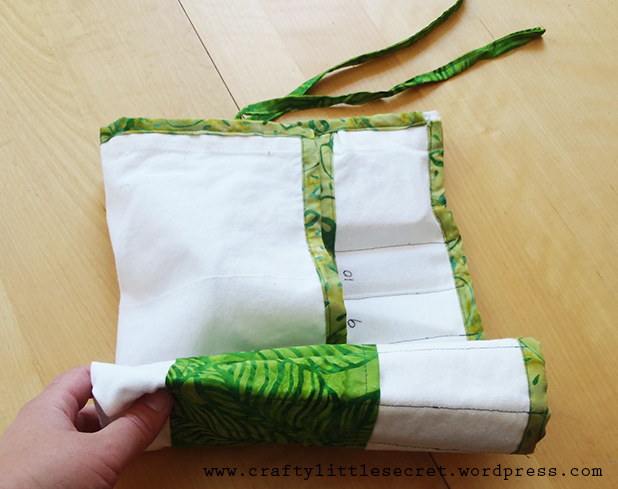 I also left a larger pocket on one side to hold odd shaped bits and pieces. And that’s it! You’re done! 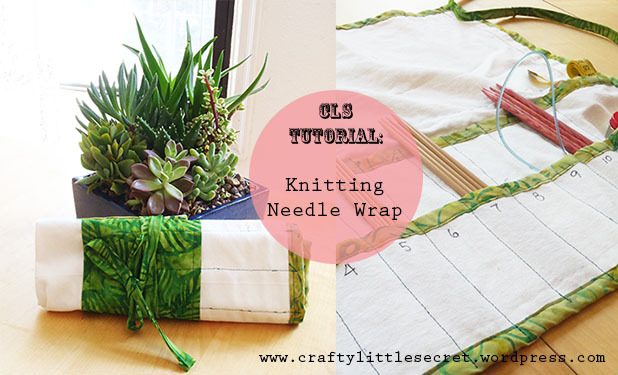 Go ahead and fill your new knitting needle wrap! As you can see in the pictures below, I also chose to label some of the pocket with needle sizes I commonly use, but keep in mind that this prevents reorganization of the roll in the future. Stuff, fold, roll, and wrap! 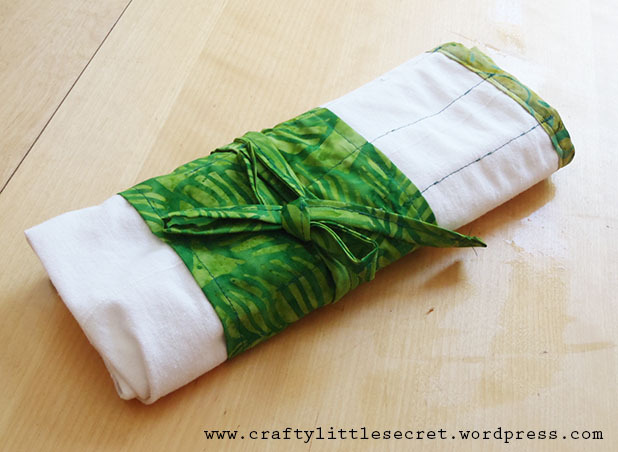 And away you go with your very own handmade knitting needle wrap! 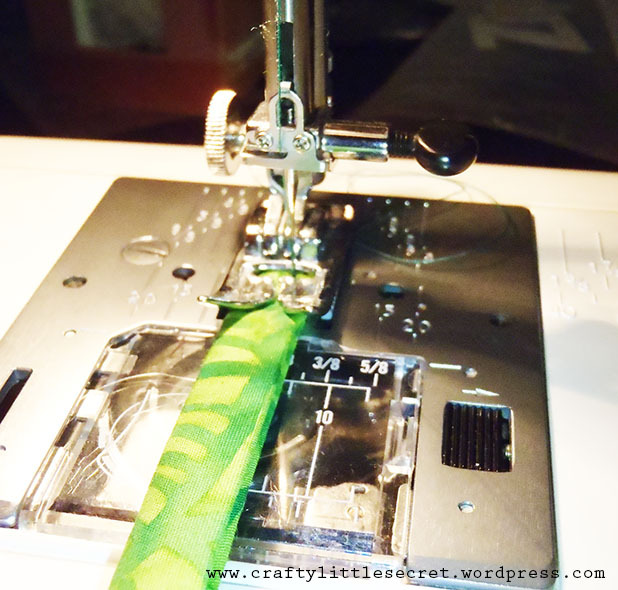 This entry was posted in Patterns and Tutorials, Sewing Projects, Storage and Organization on September 5, 2013 by missphd. 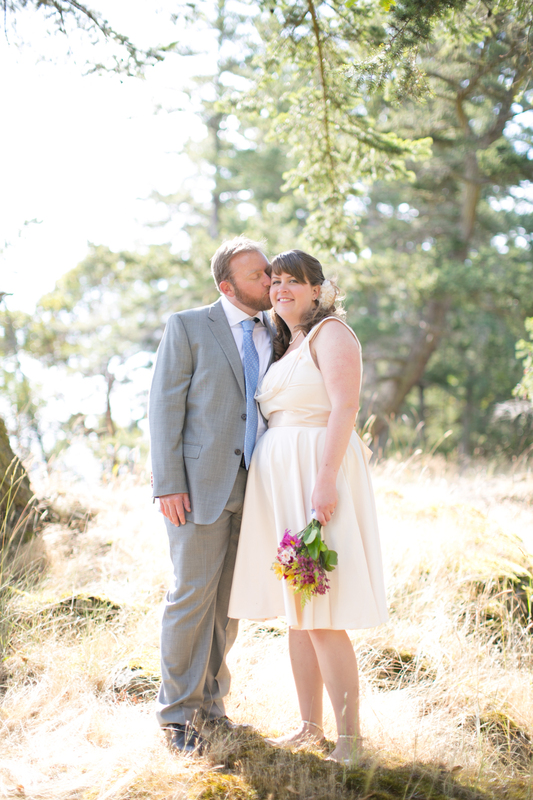 I got married last week in a small family-only civil ceremony on Jones Island in the San Juan Islands off the coast of Washington. It was perfect! It was really important to both of us to have the things we wanted without breaking the bank. For me, that meant a couple small DIY projects. One of these was the flowers. Getting married in such an isolated location puts some limitations on vendor availability. I really just had two florists in town to choose from and at a starting price of $125 for a bridal bouquet, I chose neither! Instead, I bought my wedding flowers from the grocery store!! I popped into the grocer a couple days before the wedding to scout the flower situation and found out when their shipments of flowers come in so I could buy the freshest flowers with the largest selection. 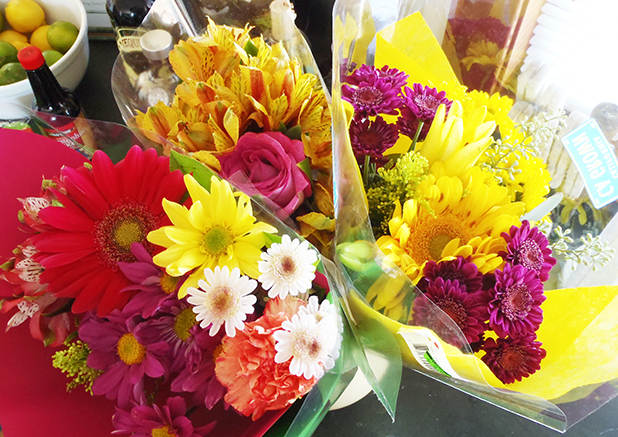 I chose three mixed flower bouquets in a purple and yellow color scheme for a total cost of $28 (that’s $97 savings!). 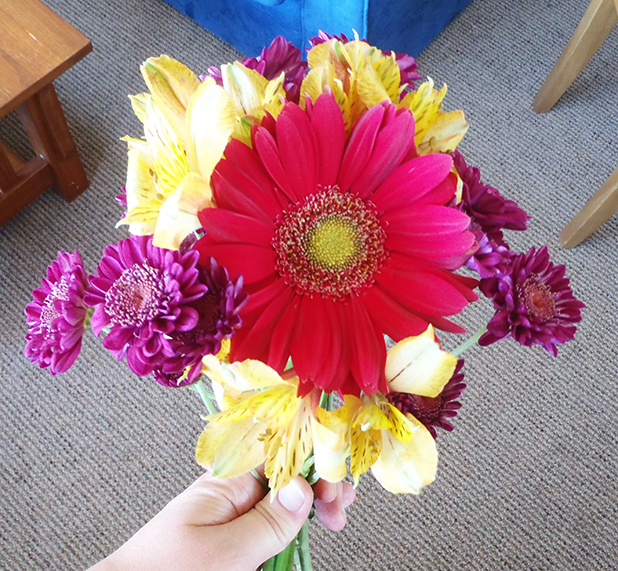 Step 1: Strip your flowers. While all those leaves and filler bits look great in a bouquet in a vase, they get in the way when trying to construct a bridal bouquet. So before getting started with any arranging, you want to strip your flowers of ALL leaves and organize them by flower type. 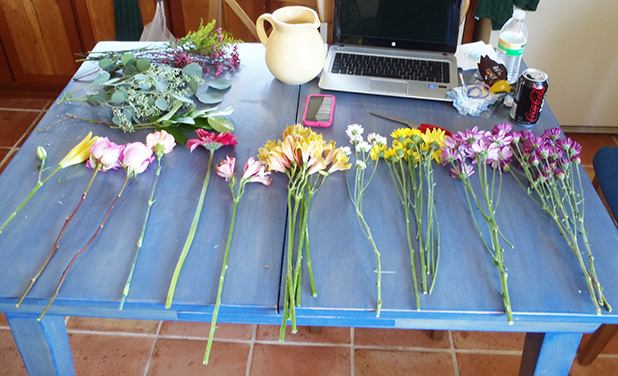 Step 2: Pick your “Show Off” flower. Once you’ve got all your flowers laid out, you’ll want to choose one or two flowers that will be the center of your bouquet. This should be a larger flower and should be your favorite. 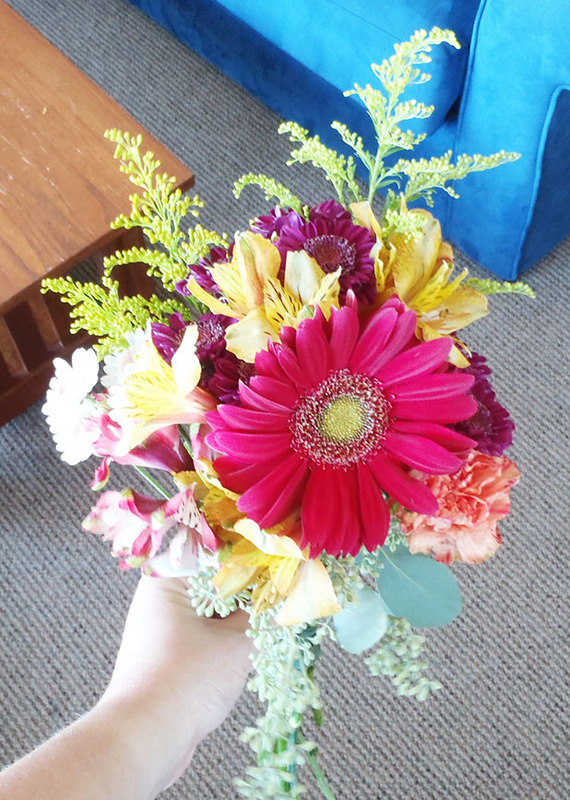 I chose the Gerbera daisy as the focal point for my bouquet. Next you want to select a few flowers to surround your center flower. When adding these it’s nice to work in odd numbers and to keep things even. 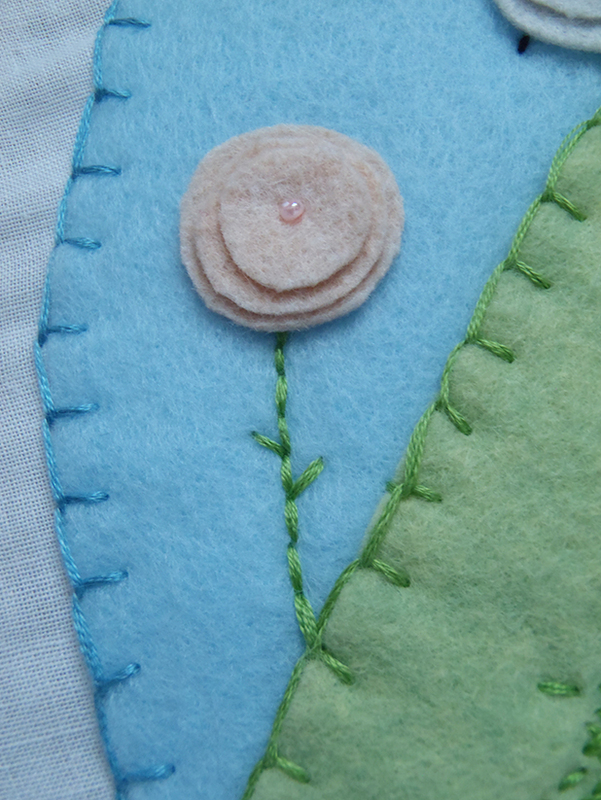 I add three stalks of flowers around the daisy (pardon the blurry photo!). Take the time to arrange these few center stalks. When you’re satisfied, use florist tape to hold them in place. 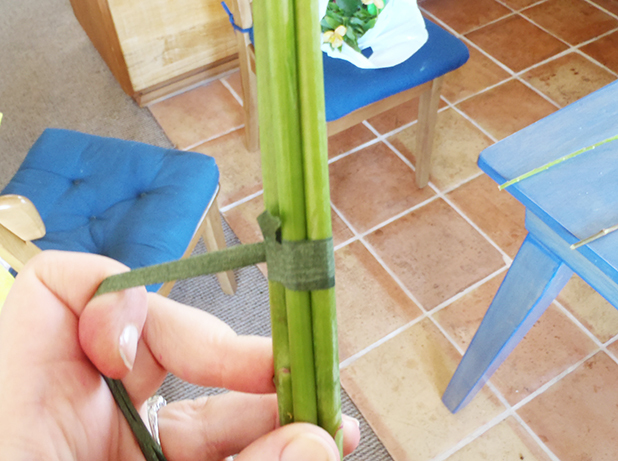 Florist tape is a stretchy green tape that’s a bit tacky, so when you wrap it around itself it will self-adhere. 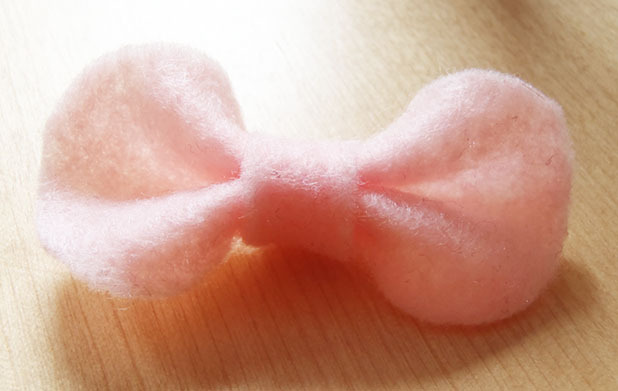 It’s what boutonnieres are often wrapped in. Step 4: Add more flowers. Next you’ll want to add a few more flowers, in the same even manner as above. 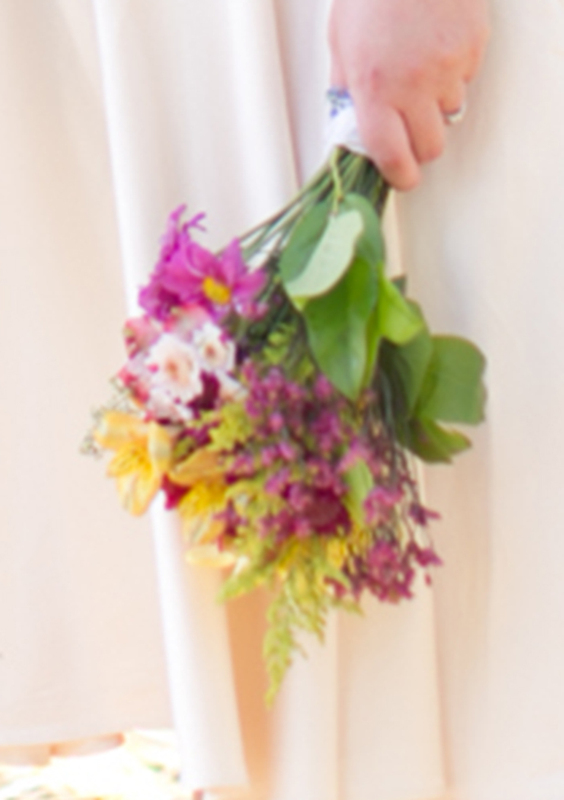 If you’re going to add odd flowers, try to balance them with an odd flower on either side of the bouquet. Here, I’ve added clusters of purple flowers evenly spaced around the yellow. 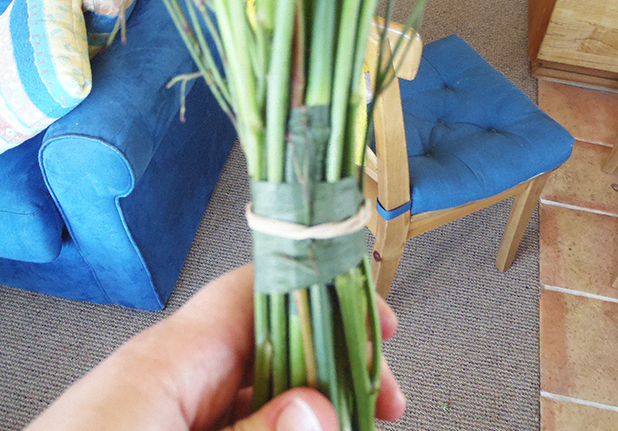 Secure the stems with more florist tape every four or five stalks. If you’re going to add flowers unevenly, try to balance them. 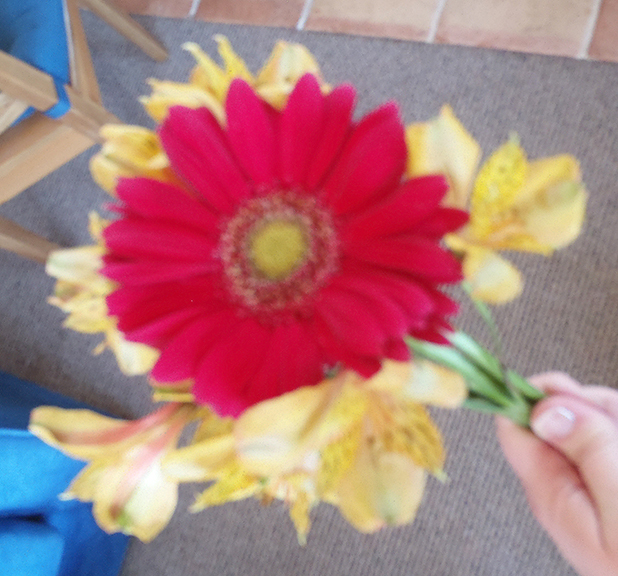 For example, in my bouquet I added a yellow lily and orange carnation to one side, then some white daisies to the other (see finished pictures). 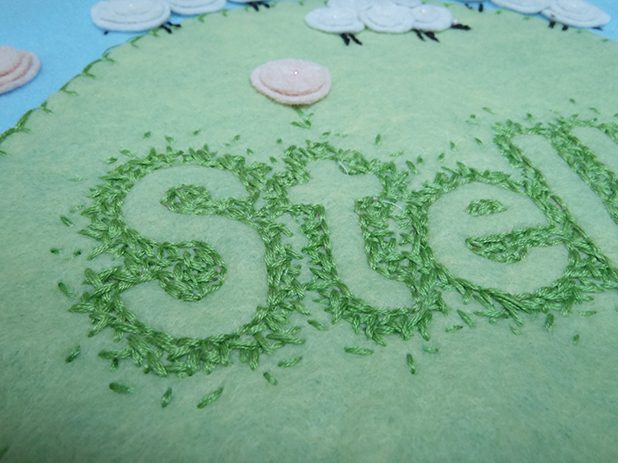 Step 5: Add your “filler” and greenery. Once you’ve got your bouquet built up a little, but not quite finished, it’s time to add your filler and greenery. I added stalks that stood up straight to the back of the bouquet and added looser more droopy stalks to the front of the bouquet. 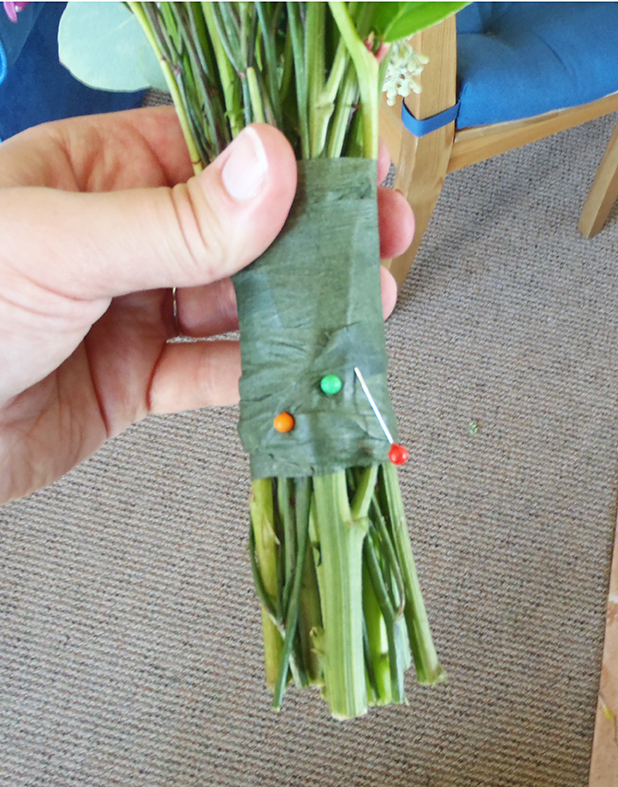 As the bouquet gets larger it gets more difficult to secure the stems with florist tape alone. I wrapped the florist tape with an elastic band when I found it was getting a little unwieldy, just to make sure everything would stay nice and secure. Step 6: Add finishing flowers. 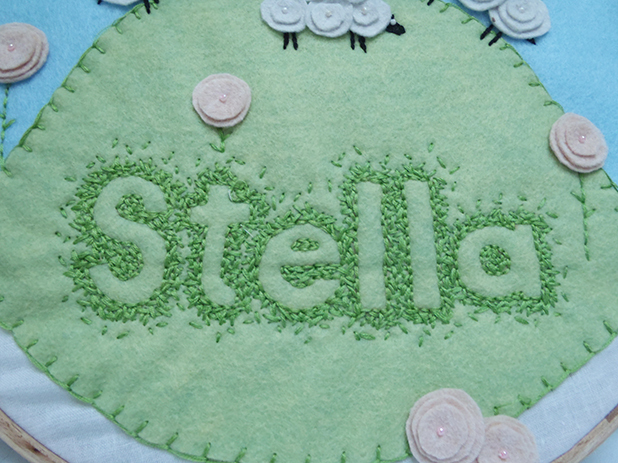 The final step is adding a few flowers to the outside to fill in the bouquet and to surround the filler and greenery. I just added flowers until I was happy with the size of the bouquet, making sure the central showcase Gerbera daisy was always visible. For the final step to keep things nice and tight, I secured the florist tape with straight pins. 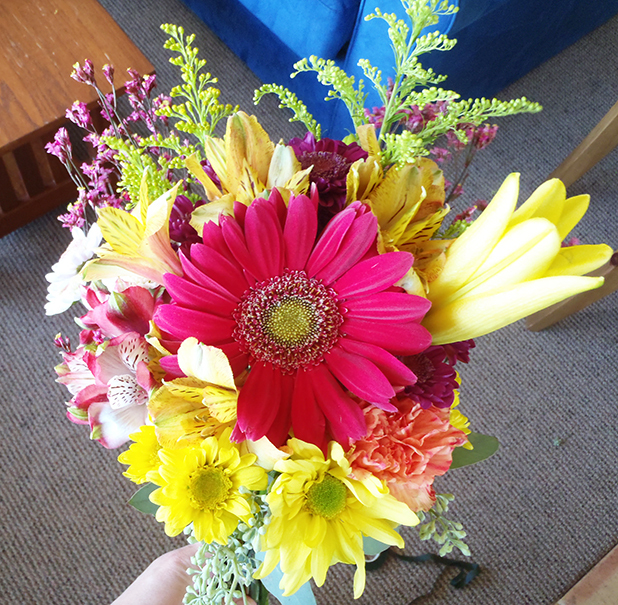 Since the bottom of the bouquet would be visible, I also took the time to give the stems a nice even blunt cut at the bottom. I don’t have any pictures of it, but as a final step I wrapped the bottom of the bouquet in my granny’s handkerchief to cover the florist tape. And voila! My finished bouquet! (I’m hoping there might be a better picture when we get our photos from the photographer. I’ll update the post if I find a better shot). 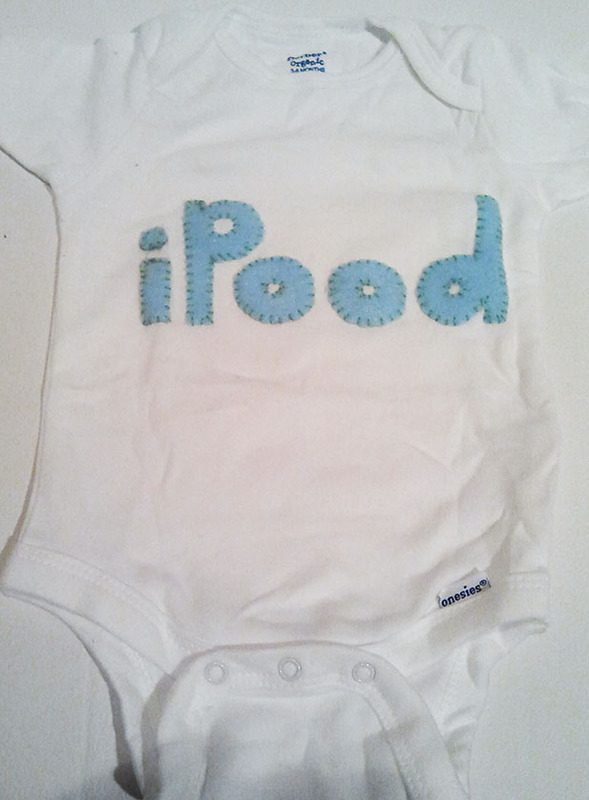 This entry was posted in DIY, Patterns and Tutorials, Wedding on July 18, 2013 by missphd. Pete has a sweater that goes everywhere with him. It’s been stuck overnight on the top of Mount Hood with him, it’s been to Yosemite, it’s been to the Alps, it’s been to sea, it’s been to Alaska. It’s been crammed into his backpack on virtually every trip he takes. It’s actually shocking that it’s taken this long to develop a hole! 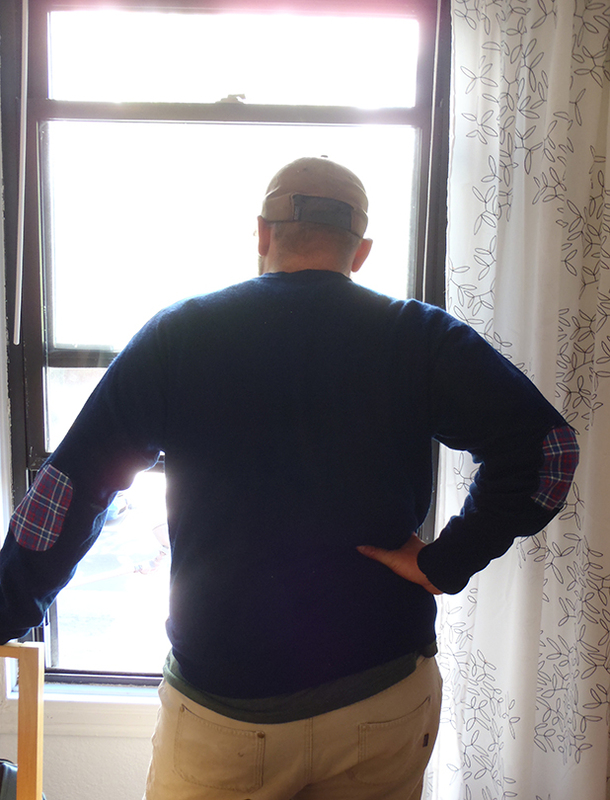 On a trip to NYC Pete saw a dude wearing a sweater with plaid elbow patches and asked if I could do something similar for him. No problem! With the knit sweater I was worried about two things if I simply sewed a patch on top; 1. that the hole would continue to grow under the patch, and 2. that the patch would be difficult to sew on stretchy knit fabric. 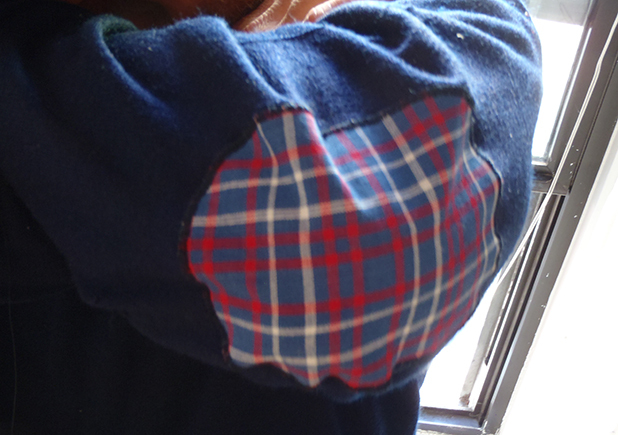 So I decided to make my own iron-on applique elbow patches using an adhesive web called Pellon. 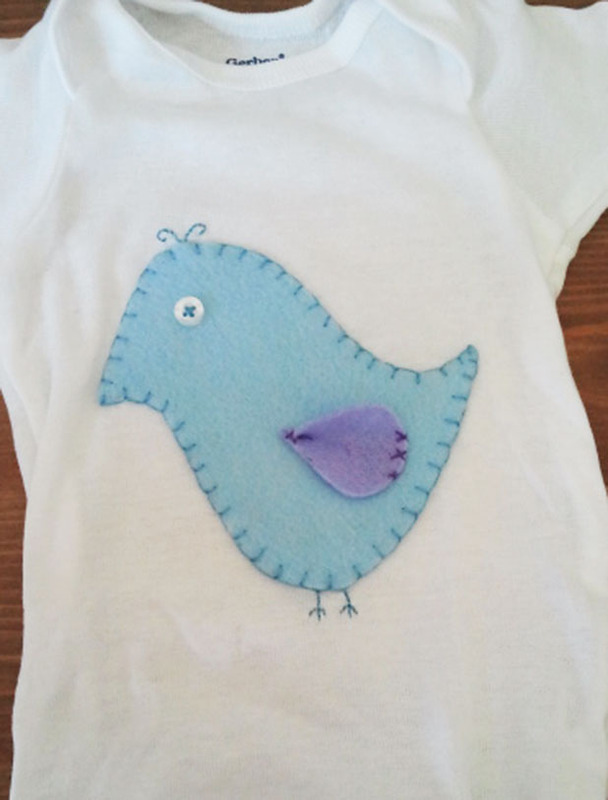 Below are step-by-step directions to make your own applique patches. 1. 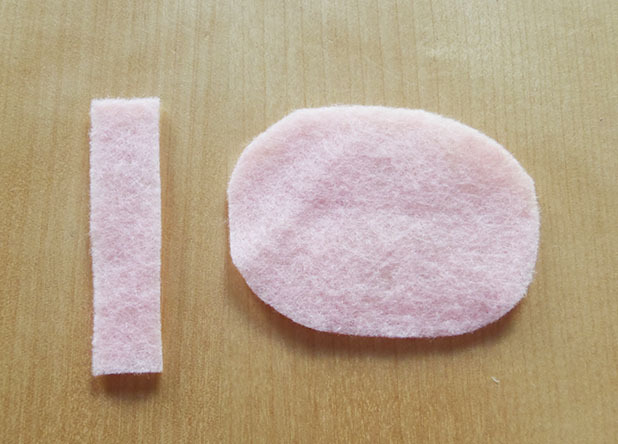 Cut out a rough shape in fabric, and the same shape, slightly smaller, from the paperbacked adhesive web. 2. 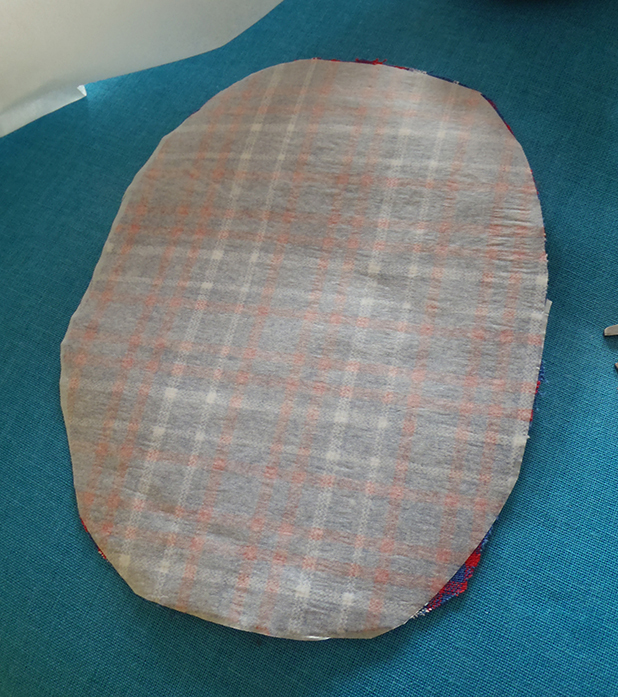 Lay the paperbacked adhesive web on the ironing board, bumpy-side-up, and lay the fabric over top, wrong-side-down. Iron on high for about 8 seconds. Now your fabric should adhered to the adhesive web. Be careful to not touch the bumpy (glue) side of the adhesive web to the iron or it might muck up your iron. 3. 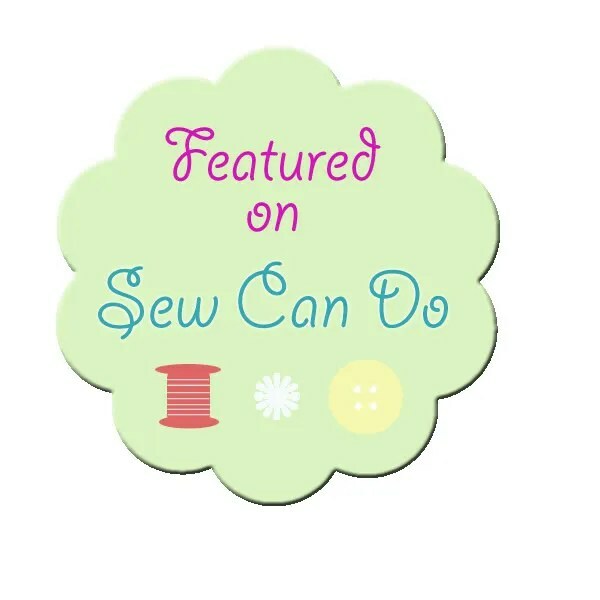 Trim the fabric fused with the web to the desired size. 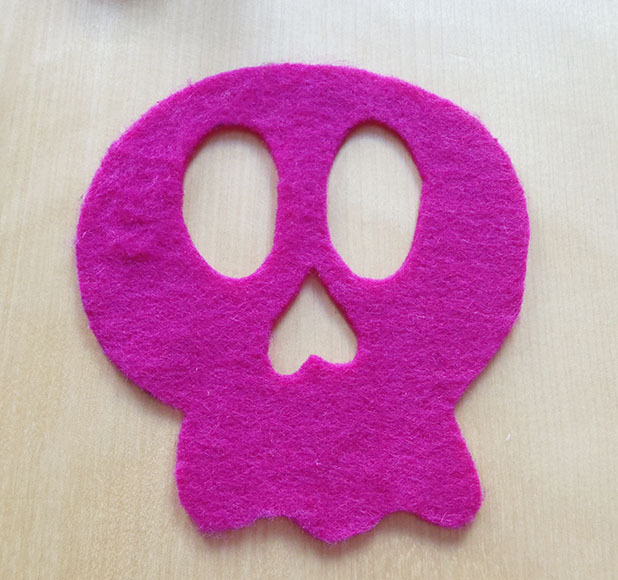 I made a patch that was about 6″ x 4″ with rounded edges. 4. 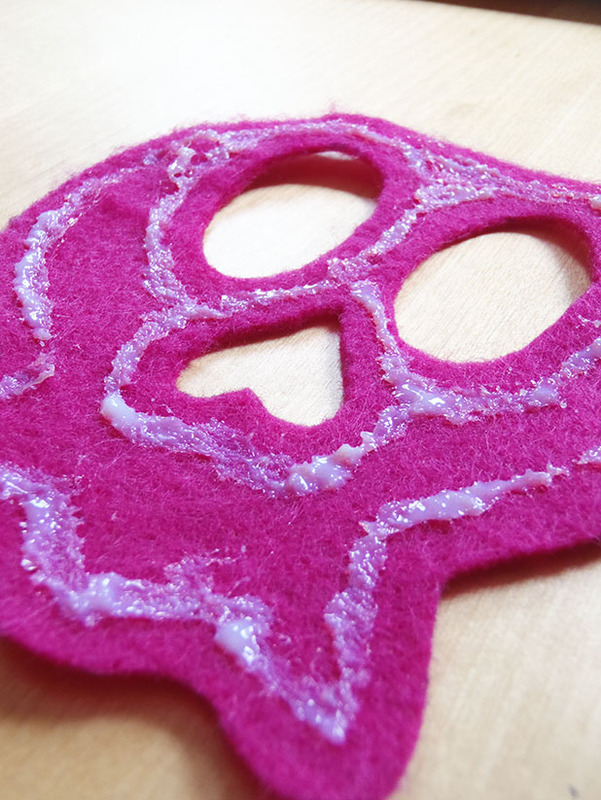 Peel the paper backing from the adhesive web. 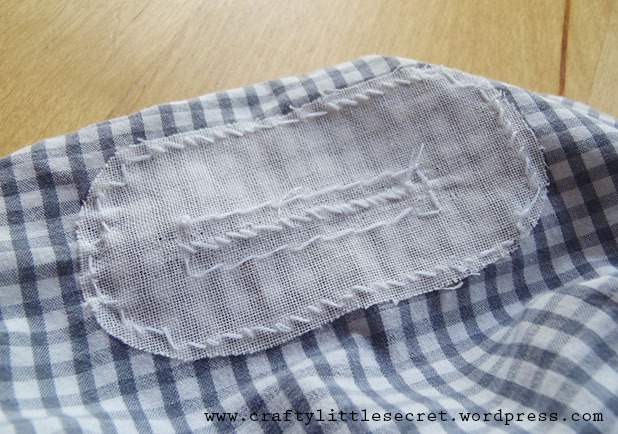 It can help to grab the edge of the fabric and make a little tear to get the backing off. Now you left with an iron-on fabric patch! 5. Make someone model the sweater so you can position the patches properly on the elbows and pin them in place, web-side-down. I did this on the side with the hole, then removed the sweater and positioned the other patch by measuring, to make sure they’d be positioned symmetrically. 6. 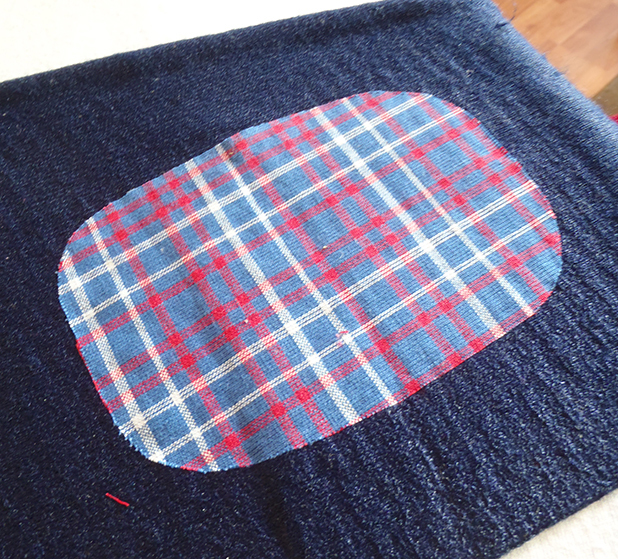 Lay the sweater with pinned-on patch on the ironing board, patch-side-up. 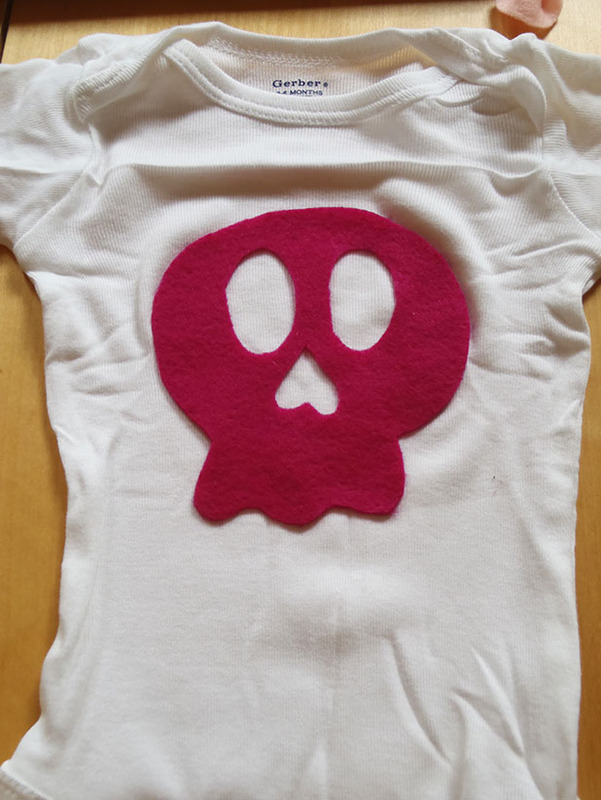 Overlay with a slightly damp towel (needed to keep the fabric from burning while adhering the patch). 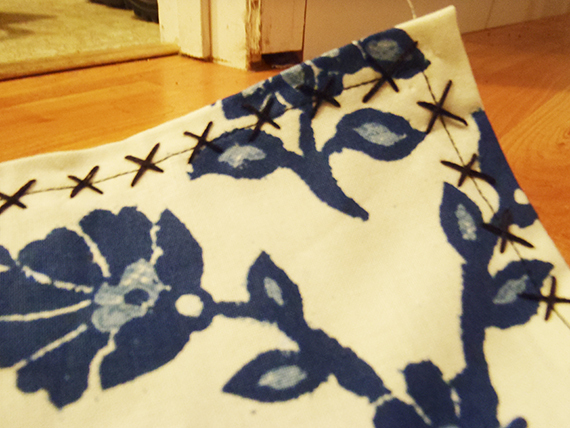 Carefully remove the pins without changing the position of the patch, then iron for ~15 seconds with firm pressure. 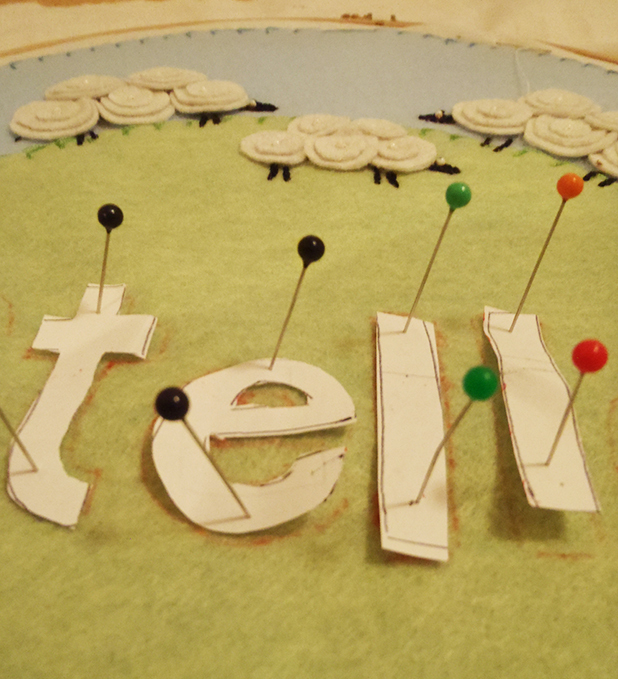 The Pellon instructions say to do this on the wool setting, but I was repairing an acrylic sweater so used the synthetic setting and found it still adhered well. 7. 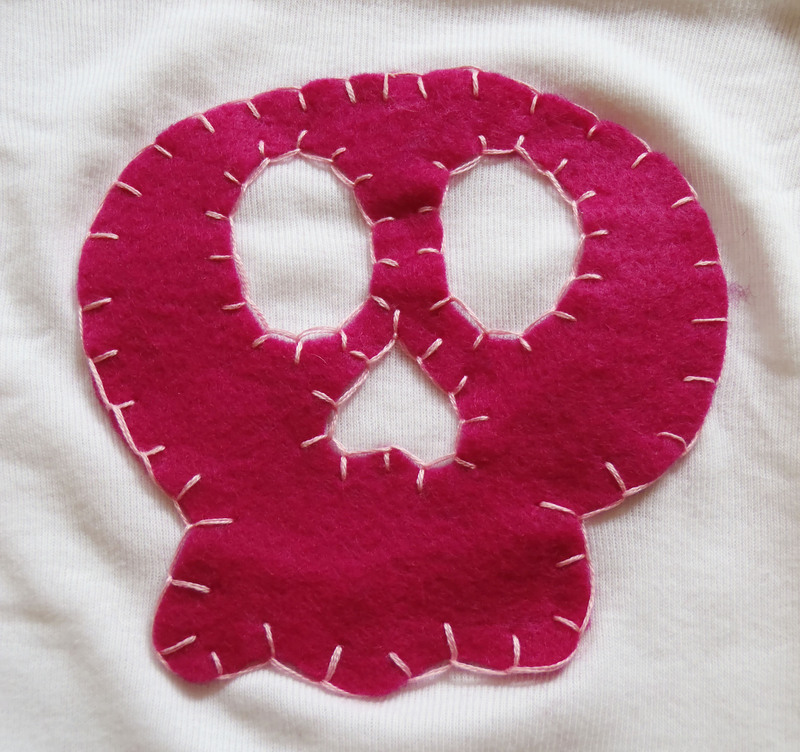 I worried the edges of the patch might peel up or fray over time so I finished them with some decorative stitching around the edge on my sewing machine. I set my sewing machine to a zigzag stitch with 4.5 width setting and 0 length setting and carefully sewed around the edge of each patch. I gotta hand it to Pete, the plaid patches were a great idea and the sweater looks pretty cute now! 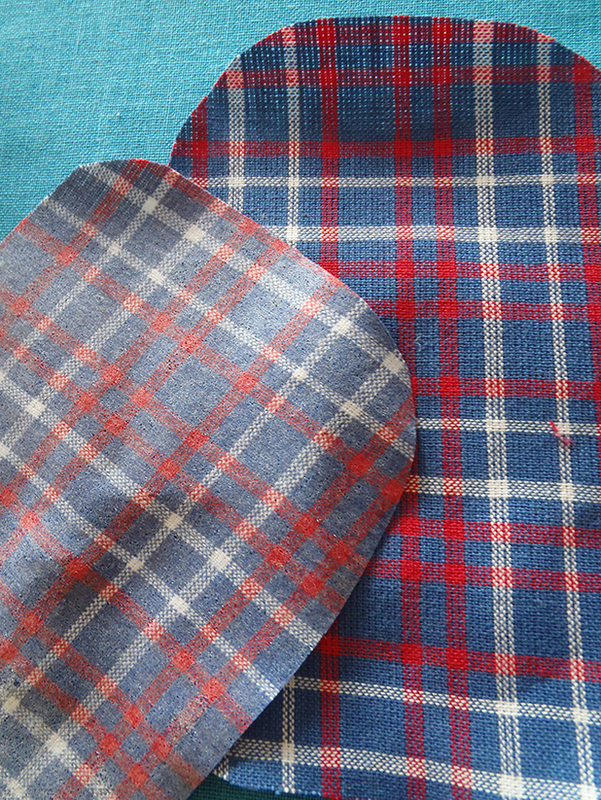 We had also debated leather/suede or corduroy patches, but I’m glad we went with the plaid. 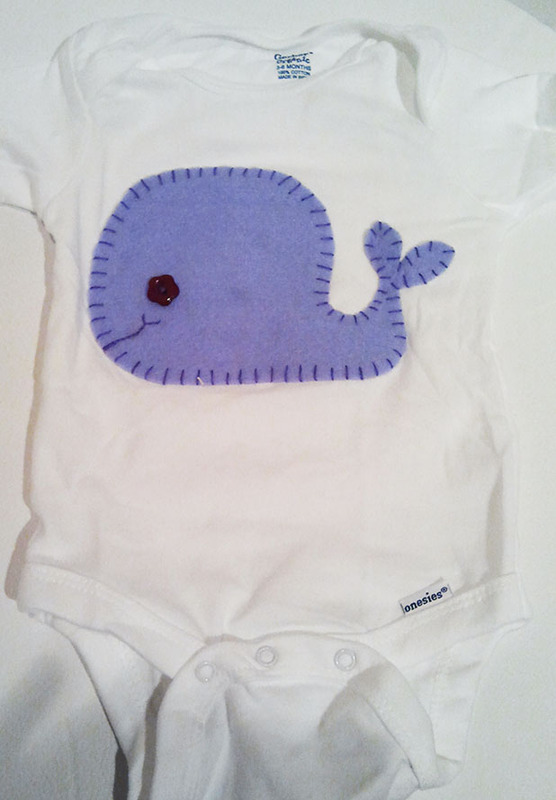 This entry was posted in DIY, Patterns and Tutorials, Refashioning/Mending, Sewing Projects on May 27, 2013 by missphd. 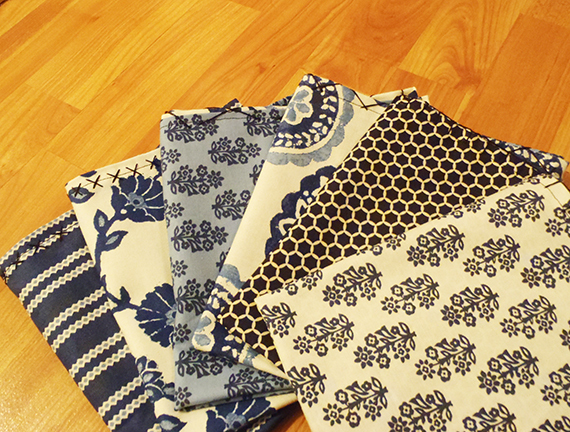 My mom’s kitchen is blue and white, so when I saw the Ravena fabric line by Dear Stella on Fabricworm I immediately thought of her. 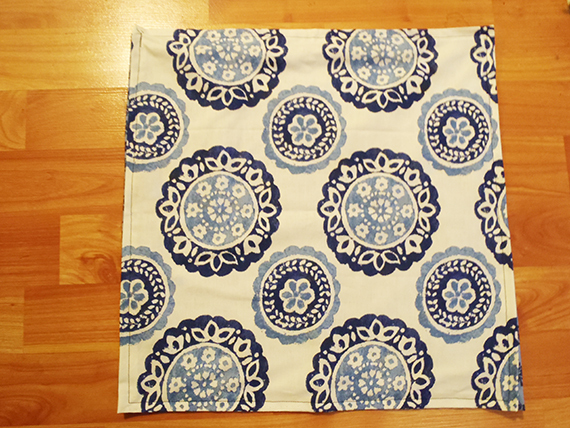 I decided to make her some simple double-sided cloth napkins for a birthday/Mother’s day gift and I’m pretty pleased with how they turned out. 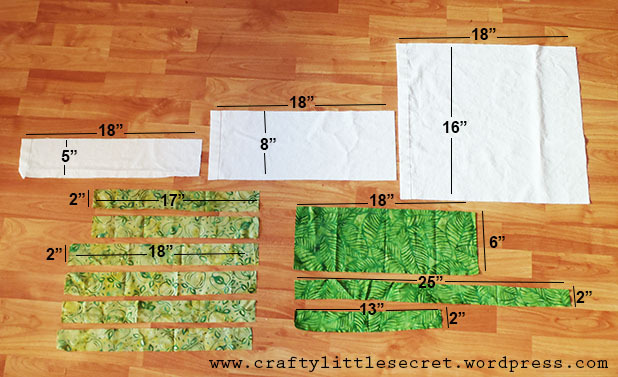 I started with a half yard of each fabric (the smallest size I could order) and cut two 17″ squares of each using my rotary cutter. Reflecting on the New Year’s resolution I made this year to be more patient with sewing projects and take the time to use proper techniques, I did something that I’ve never done before…..I ironed my hems! 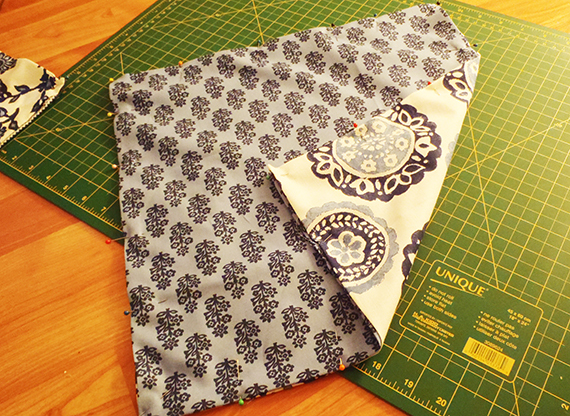 I folded the fabric 1/2″ on all sides and ironed them flat to make them easier to pin and sew. 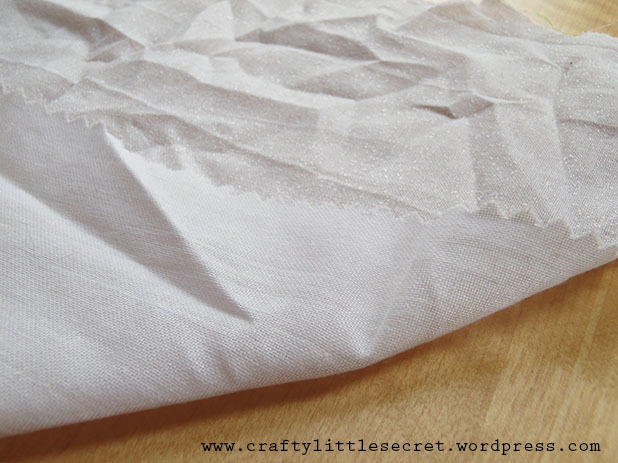 When I got to the corners, I tucked the fabric in to make much neater mitered corners. I then pinned the fabrics with wrong-sides together in pairs of light and dark fabric, making sure that the folded edges stayed tucked inside and taking special care to make sure the corners stayed neat. 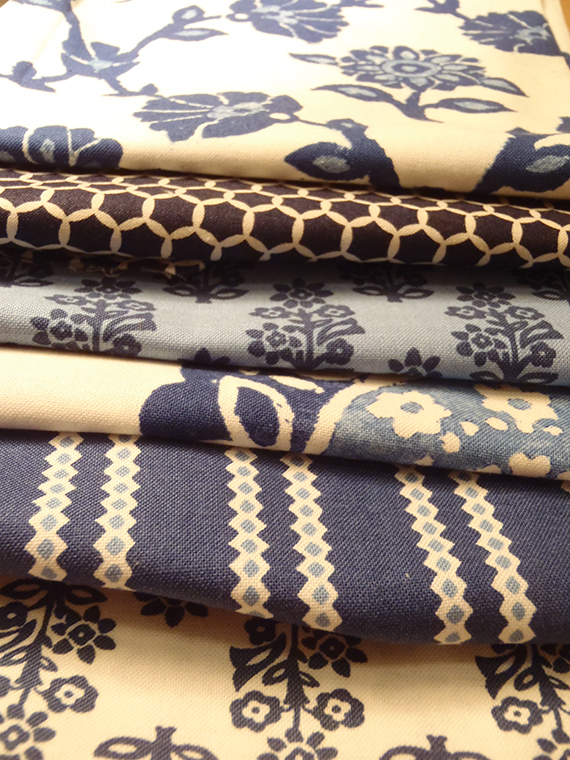 (Note: when buying fabrics online, if you purchase fabrics from the same line/designer you can be assured the colors will match). 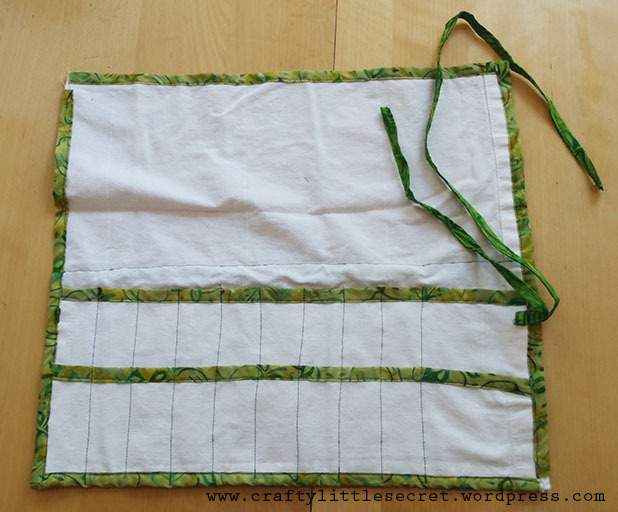 It was only after I top-stitched around the edge of each napkin, with about 1/4″ seam allowance, that I realized making the napkins with one dark side and one light side might not have been the best idea – if the light side gets stained, the dark side makes it so it can’t be bleached! Ooops! The napkins were probably good as-is at this point, but since they were for a gift I wanted to add a little extra handmade touch and decided to embroider a decorative border around the edges using navy embroidery floss. 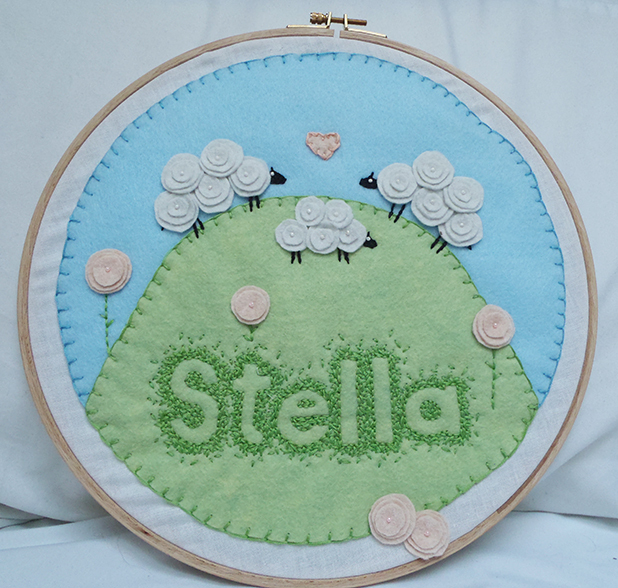 I used three different very simple stitches. 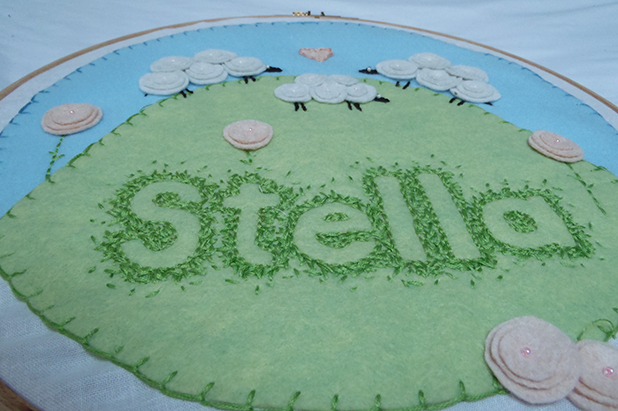 The small ‘x’ pattern was made by sewing the first lines of all the ‘x’s all the way around the napkin, then going back and crossing over with the line in the other direction to complete the ‘x’ (like cross-stitching). 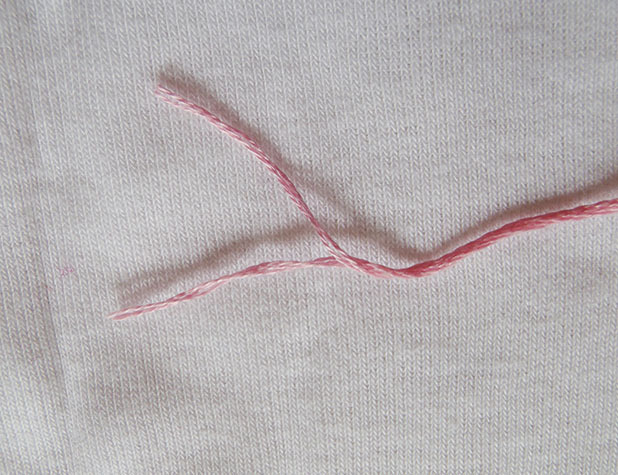 The larger ‘x’ pattern was made in the same way except the embroidery floss was brought up and over the edge of the fabric so that the ‘x’ pattern actually wrapped the edge of the napkins. I also made a couple napkins using a basic blanket-stitch (I was actually a little disappointed with how these ones turned out, I was hoping the edging would be more visible). 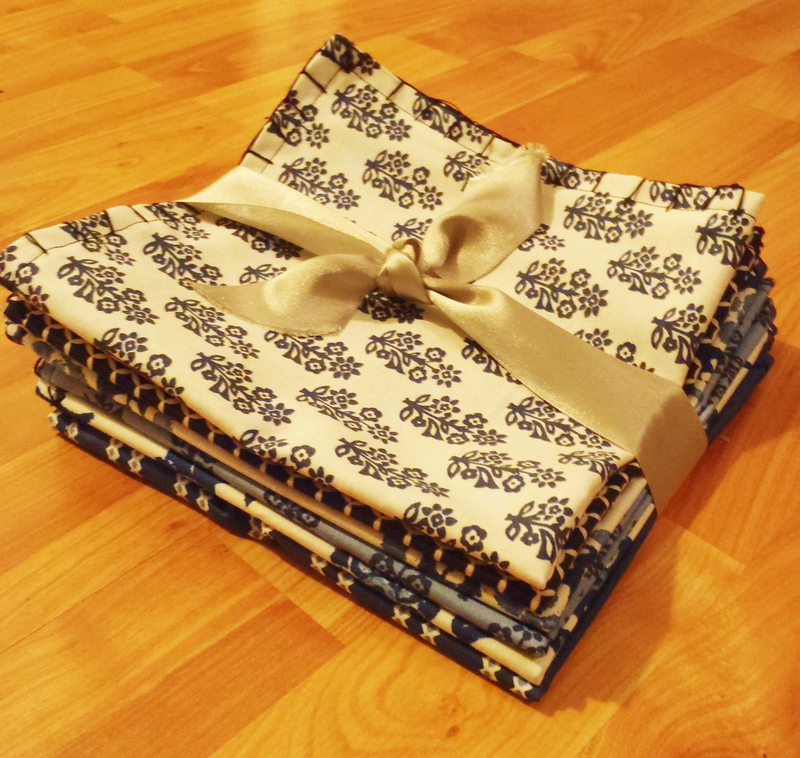 I gave them all a final iron before folding them neatly and wrapping them up with a bow for the gift! I think my mom really appreciated the gift, especially since it turns out her old navy napkins had been getting faded and she’d been searching for some new ones to replace them! 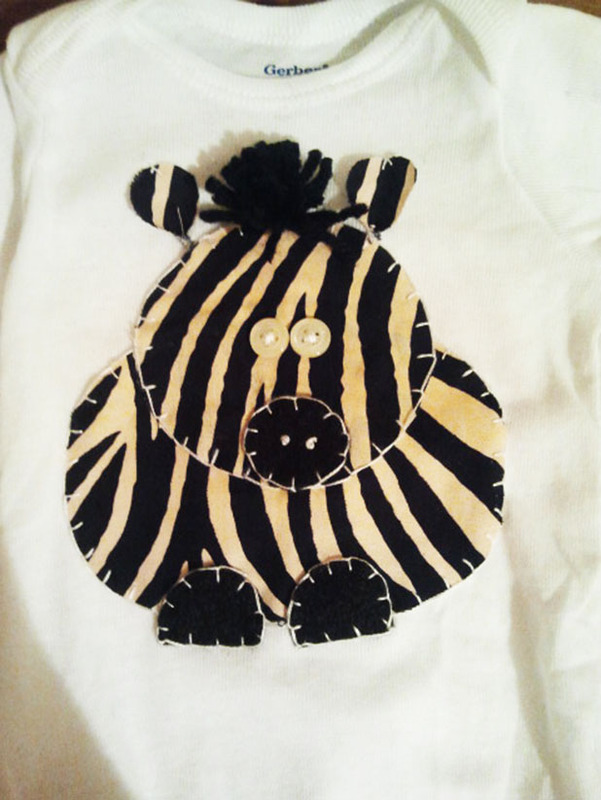 This entry was posted in DIY, handmade gift, Patterns and Tutorials, Sewing Projects on May 15, 2013 by missphd.